After a not very nice year last year between everything, I had hoped that this year would start better – but that was not to be. I’d had problems with one eye towards the end of last year, with more than one visit to the optitian to keep an eye on it in case it was the start of my retina becoming detached. Over the Christmas and New Year holiday the other eye started with the same flashing symptoms and floaters, except it was interfearing more with my vision. So after a discussion over the phone with the optitian it was down to the optitians to have my eyes looked at again on the first Thursday of the year. He wasn’t happy with what he was seeing and referred me to a hospital around 30 miles away, making an appointment for me the following afternoon. The consultant/surgeon of course wasn’t there, it being a Friday afternoon at the end of the holiday period, so when the doctor who examined my eyes realised that I’d got a tare in my retina and that was causing the retina to come away from the eye, she had to refer me on to another hospital for an emergency eye operation. It was gone 6 pm by the time she got things sorted. I had to be at the Bristol Eye Hospital for an emergency operation by 7.30am the following morning. A journey of over 100 miles further. Oh, and I had to put some drops in on the way so that my eyes were already dilated before I got there. So, off I went, and after form filling, further looking in my eye, etc., followed by the opperation, I was sitting back in the ward by 11.00am and not allowed to lie down for five days because they’d put gas in my eye to press against the tare, and gas rises and with the tare at the top of my eye the gas bubble had to be kept there. I’m now awaiting a further follow-up checkup to see how things are progressing. The reason I’m telling you all this is that, of course, I needed someone to drive me to these places, (as, even if my eye wasn’t causing me problems, my M.E. means that there is no way I could have driven myself those sort of distances) – and the people who drove me were various members of my family. I wanted to make something for them as a thank you and decided on some jewelery. And while I was at it, make one for myself as well. 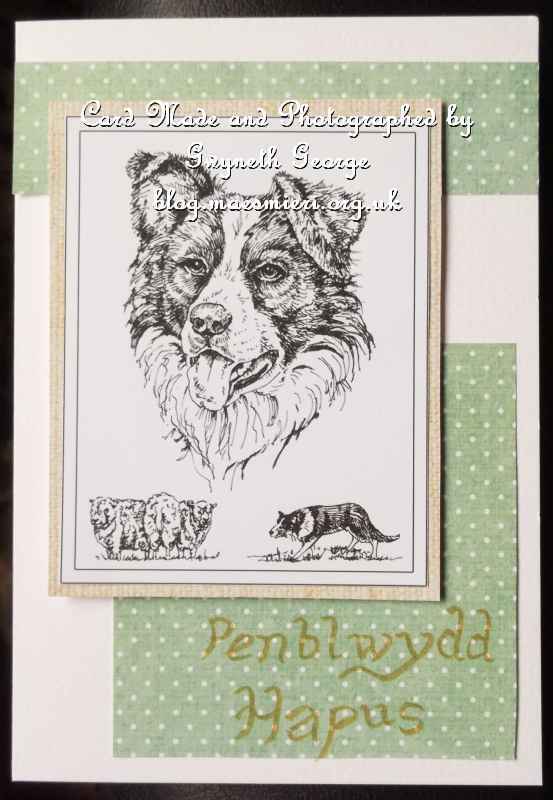 And that is what I’ve got to show you today, made towards the end of January when I was alliwed to hold my head downwards again after the gas bubnle had gone. 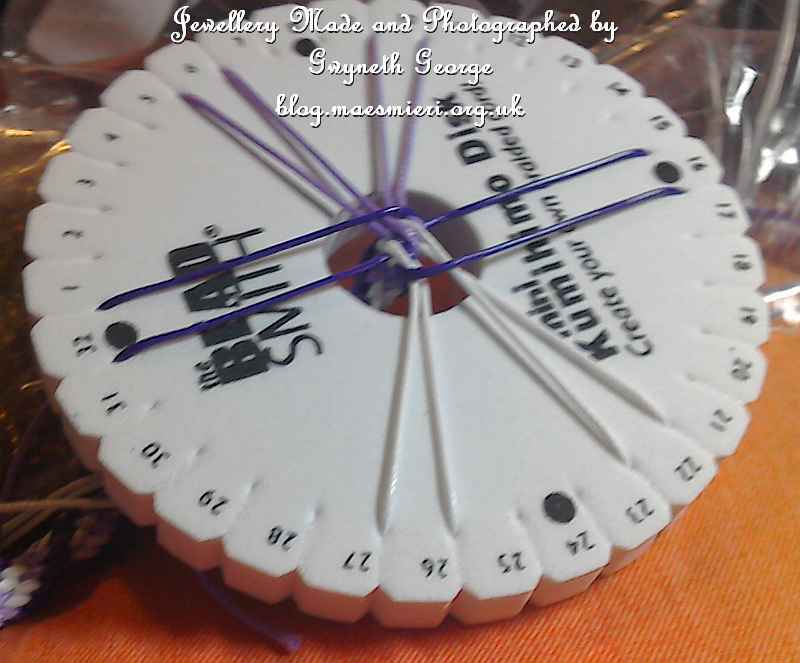 I did start off with a pack of kits to make several bracelets of the same design, but of different colour combination, which included very clear instructions. 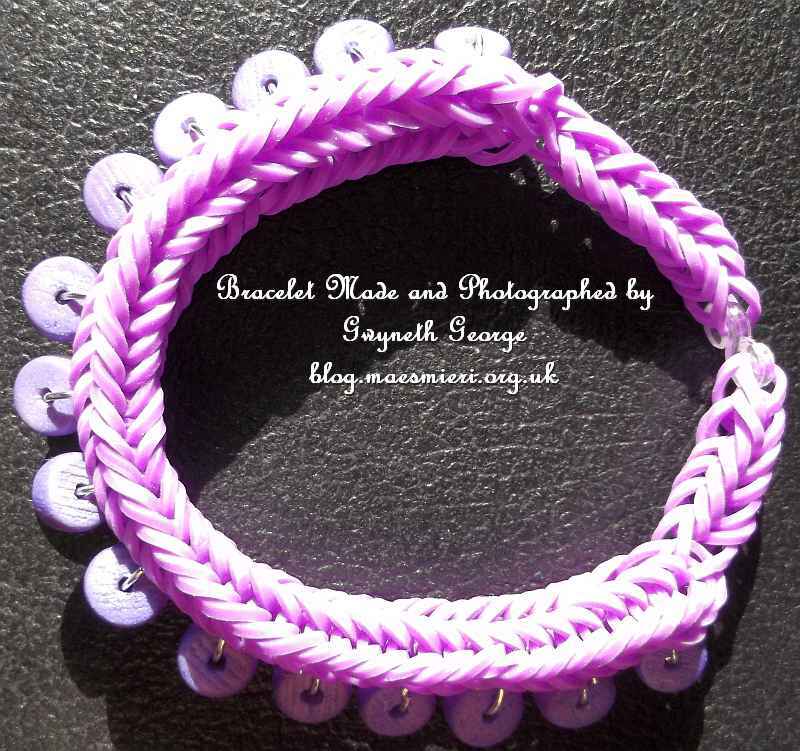 The kit was by TotallyBeads and is called – Next Generation Elastic Bracelet Kit with Czech Cabochons and Superduos. 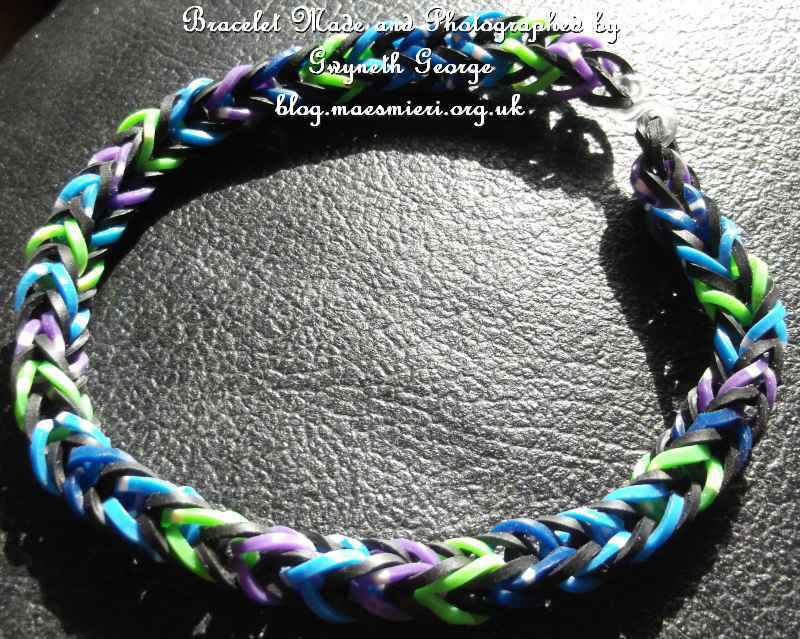 The only problem was that I have very big wrists so had to source the beads for my bracelet from elsewhere. 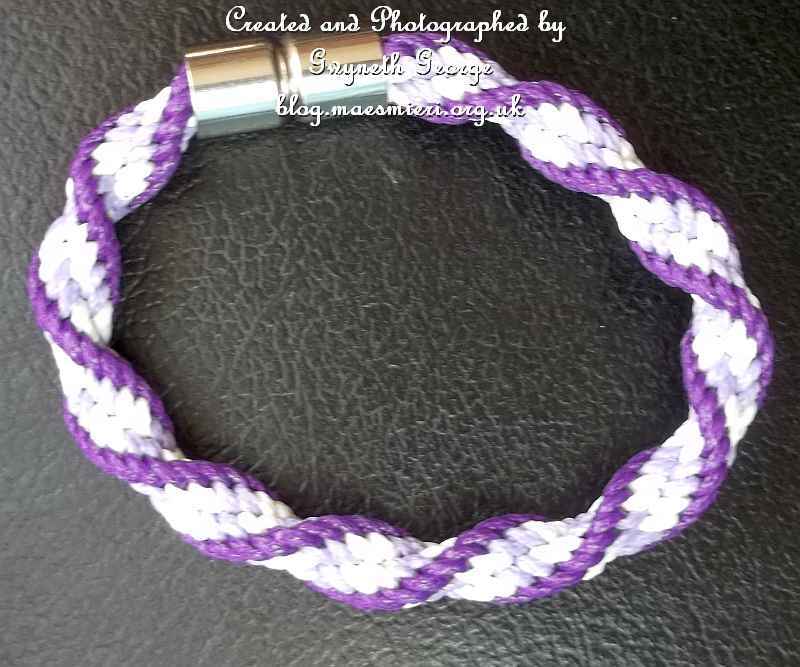 I gave people the choice of which colour bracelet they wanted to receive. I’ve still got a fewfrom the collection of 7 to make up. They may be given to charities, I havent decided yet. This is the one my youngest sister chose. 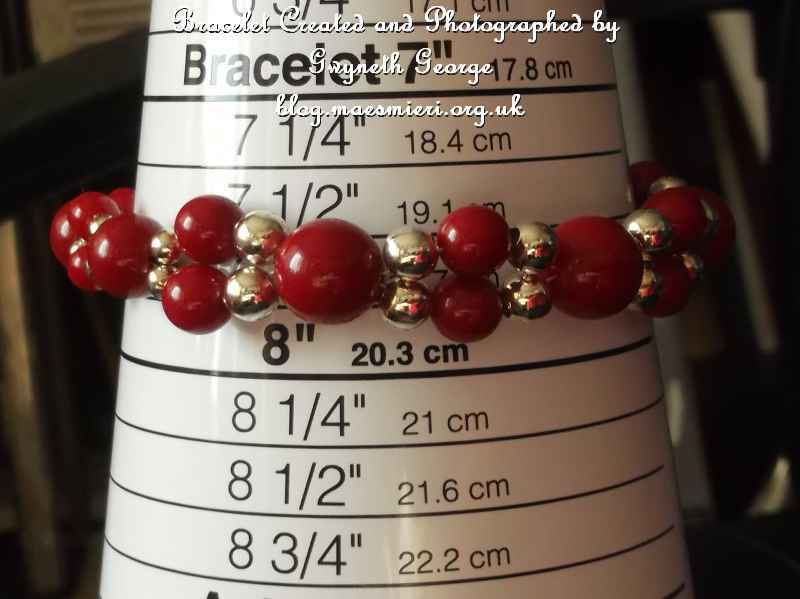 I didn’t tie the bracelets off until they had been chosen as it allowed me to get a perfect fit by removing some beads. This first one was chosen by my youngest sister who made the journey to Bristol with me, not only for the opp but a fortnight after I came out she took me back for the first checkup. This is the one I made for myself. And hopefulky you can see the difference in sizes in this photo. For my niece, who drove me to the ‘local’ hospital and then on to my youngest sister’s house, I made this bracelet. After adjusting the bracelet to fit her I had enough beads left to make these earing drops. 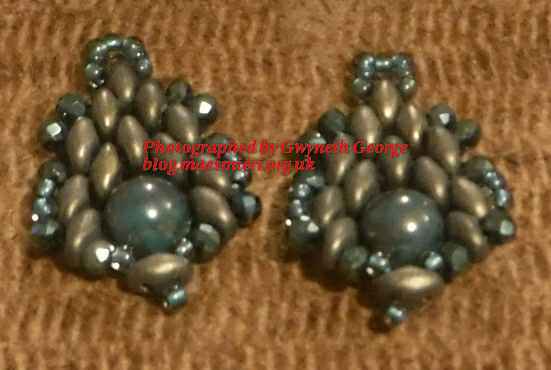 I added a pair of silver fishook ear wires to the drops before giveing then. So, what to work on next? Not quite sure. I’ve got so many different types of crafting projects either on the go or ready to start, so I guess what I do next depends on where my aches and pains are worse. I’m still working my way through partly written draft posts in my blog interface, as well as photos in my folder on my laptop that’s marked as photos of unblogged items. 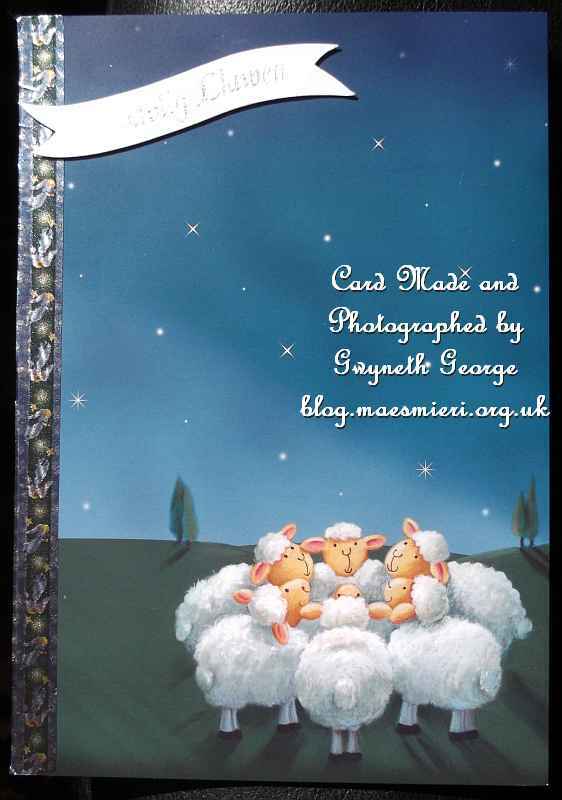 Today’s post is showing a couple of items I’ve got photos of and think they haven’t been blogged previously. I may be wrong about that. I don’t have many details about the makes either as I ohly have vague memories of making them. I’m not sure whether I’ve shown this first one before. I found just one picture of it in my album of unshown items. So it might have been that I only took one useable photo, or that I sorted and deleted previously but missed deleting this one. It’s a wire work bangle made over a circular jig. 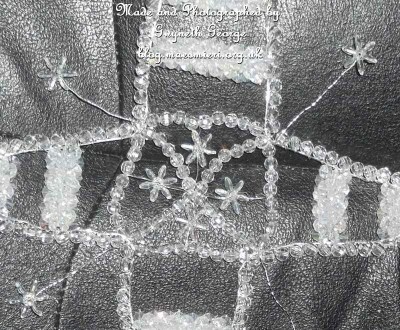 I then used thinner wire to add some beads. 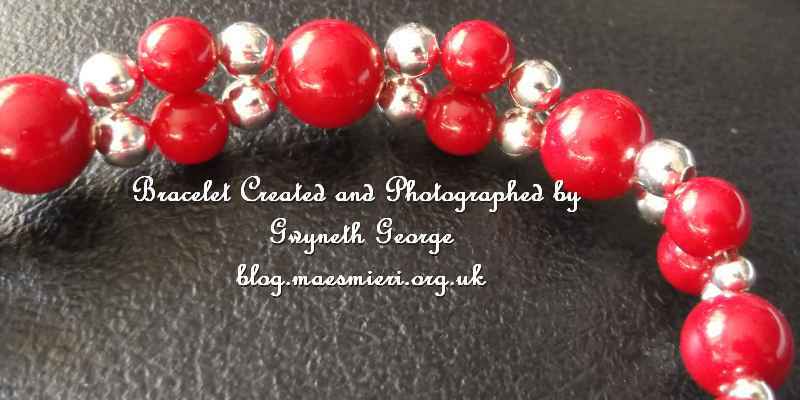 This is another beaded item that I’m not sure whether I’ve already blogged or not as it’s still in my unblogged photos file but I’ve also got one photo trimmed and watermarked in my sorted bundle. 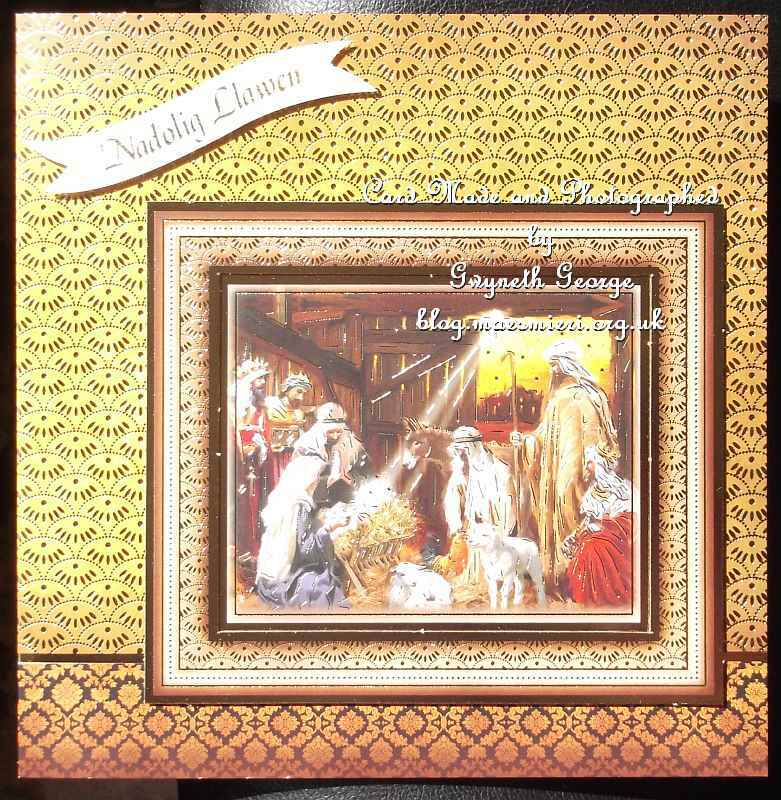 I can’t actually find it in my blog, so I might have just shown it on a group on FB the Christmas before last. As you can see it’s made from clear faceted acrylic beads and “star” shaped beads worked on a heavyweight wire frame with the beads attached using a thinner wire. So, just a small, quick post today, but I’m on a roll now. Who knows, I may even get blog posts of some sort published for all the items partly written in drafts. As well as writing quick pists from scratch for more photos stored as unblogged. 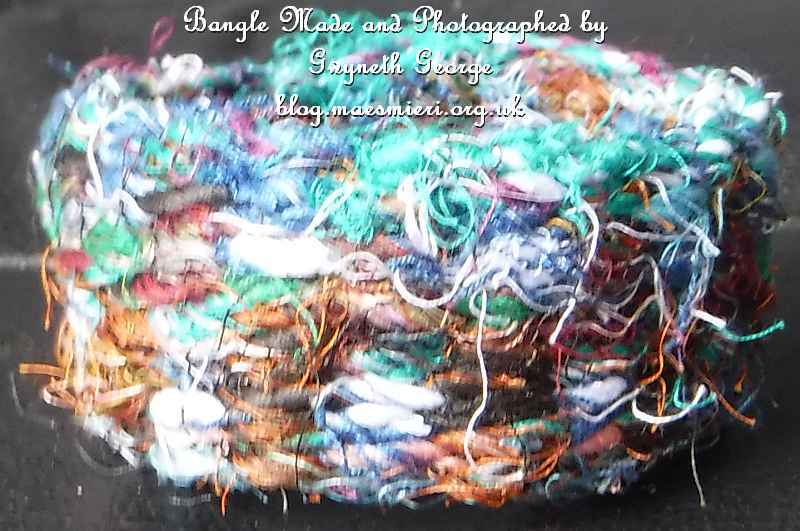 And, of course, I need to take photos of the few items I’ve made the last 18 months or so that I can find that I missed taking a photo of because I was too exhausted and in pain to think of photographing at the time. I’m back with three very different makes. 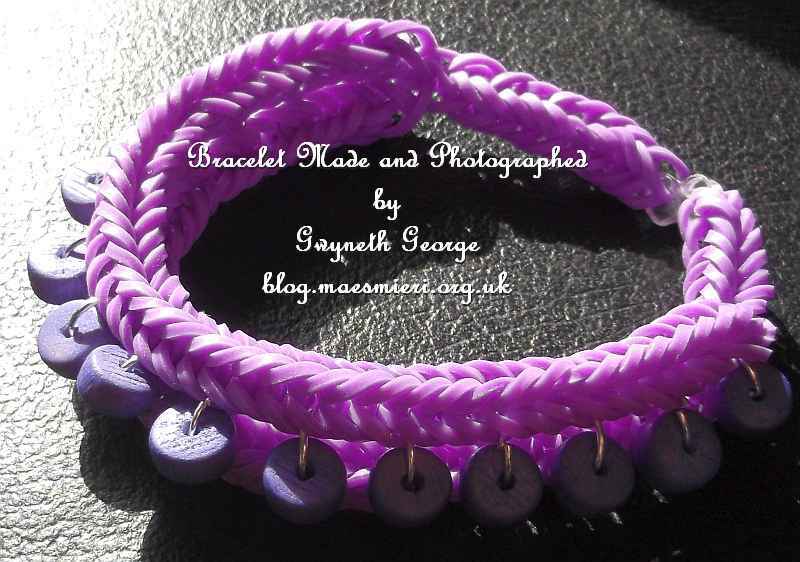 The first is one of the creations I made last year but never got the strength to blog at the time, and the other two are this year’s makes. Hope you like them. If you’ve got the time leave me a comment to say what you think. Thank you. 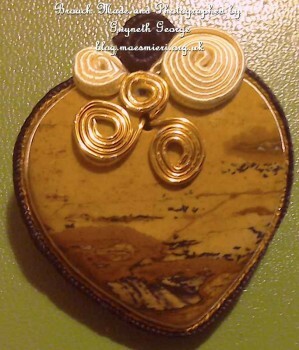 This is a broach I made for myself last year. The stone is Jasper. I did some very simple soutach together with some wire work coils. The photo is appearing a bit green on my screen but it isn’t in real life. This is a glasses holder I made for my mother. Her old one had broken. 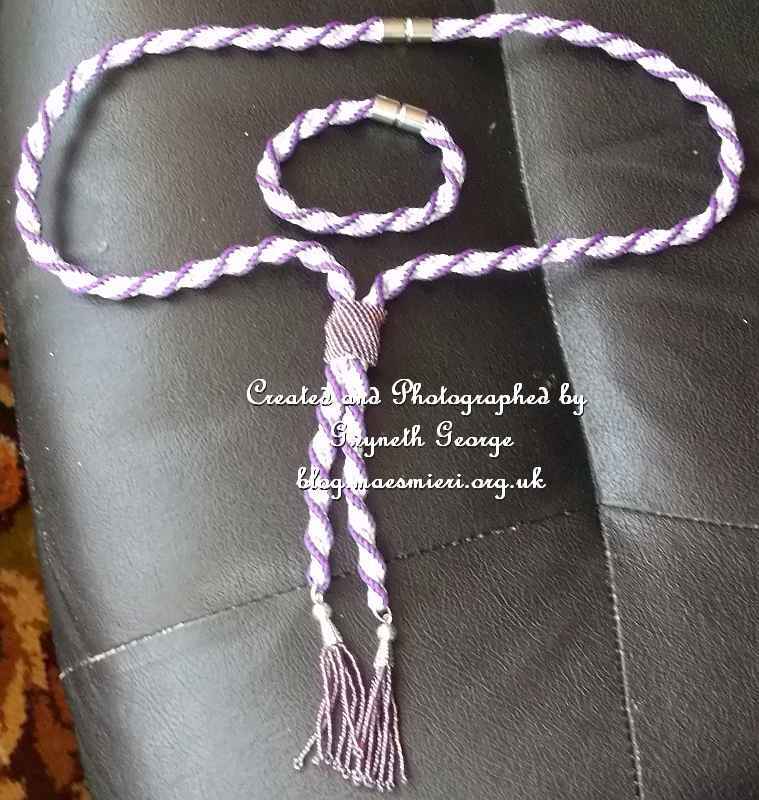 The first time it was at the end where the glasses are attached so I was able to repair it with findings from my stash, but this time it was the jewellery wire that had broken, and I decided it was time to make her a new one. 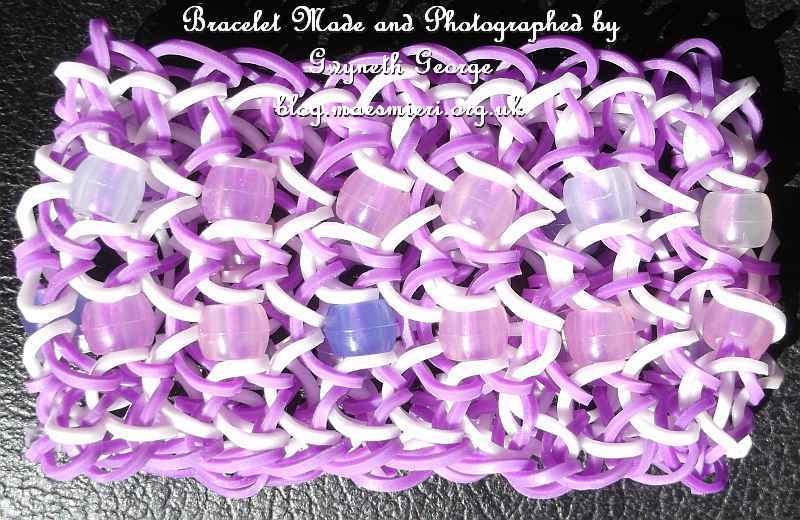 This is made using a bag of assorted purple seed beads. 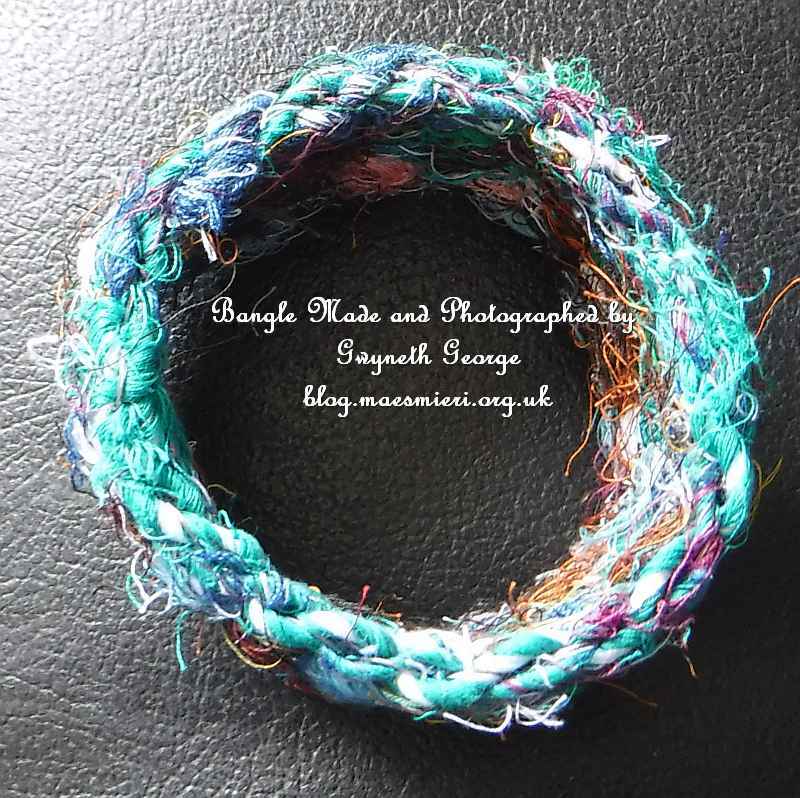 This is a bangle – made using the Kleshna bangle making loom and yarn made from sari silk cuttoffs. 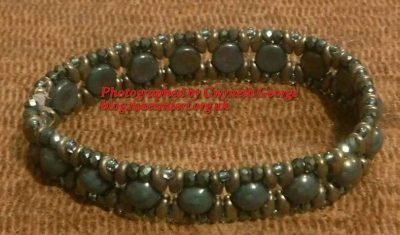 When he saw this my nephew said it looked very “celtic” – in other words, ethnic or might have been the type of thing worn in olden times. Three completely different makes I’m sure you’ll agree. Just a short post today everybody! In between my little bits of crafting I’m working on now I’m still working my way through photos I took of my makes during the previous year. 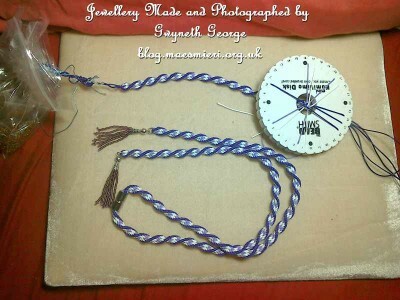 This time it’s the time of a set of jewellery I made as a birthday gift. I hope you like. This is a kumihimo jewellery set of necklace and bracelet with some fine beaded additions. It came as a kit. The only problem is that I can’t remember now what kit, and from which company, it was. 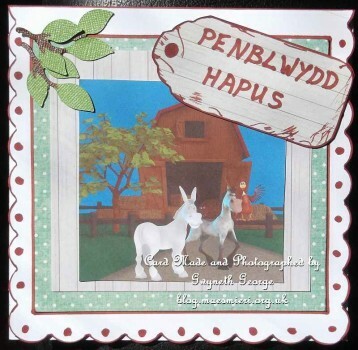 I know I gave it as a birthday gift to a family member last September and had made it ready a month or two before that, so quite some time ago, so it’s no wonder I can’t remember where the kit came from, but I really don’t like blogging without giving an indication of where others can get find what I’ve used. These are some of the photos I took as I was working on the project. My niece graduated from uni. 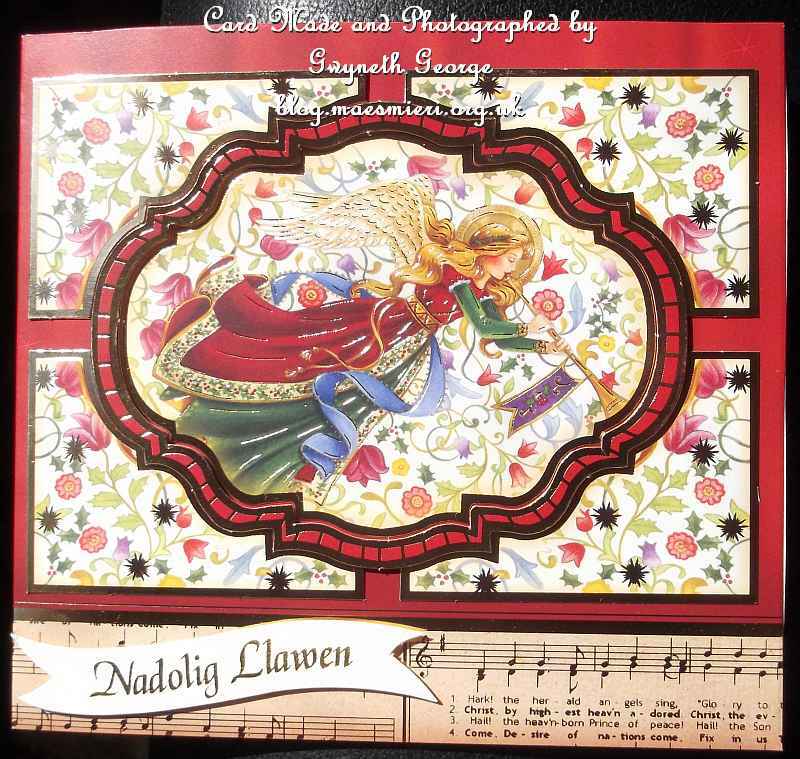 this year and I wanted something different to put on her card. 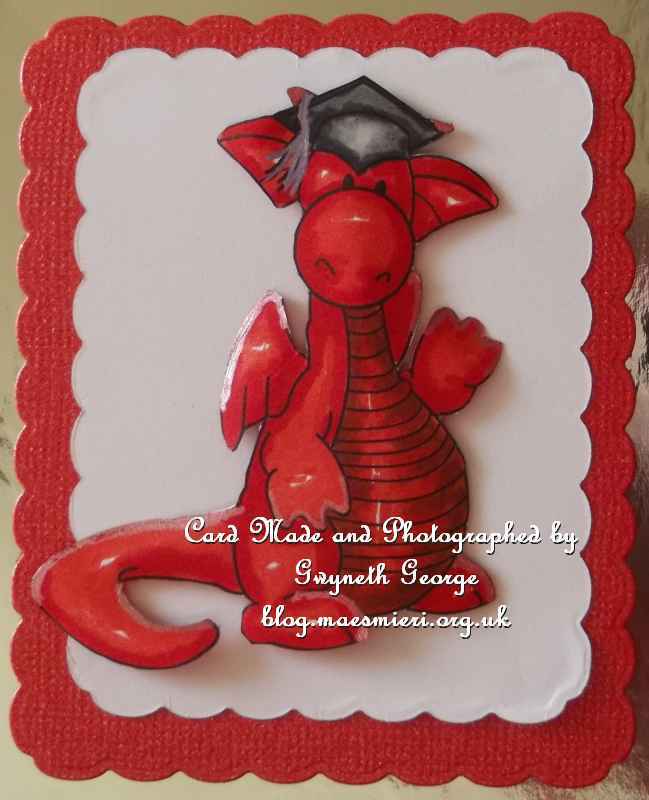 So I asked the talented Janette Padley of Dragons Lair Designs if she had a digi-stamp of a dragon wearing a mortar board graduation cap so I could colour it up as a little graduating red dragon. 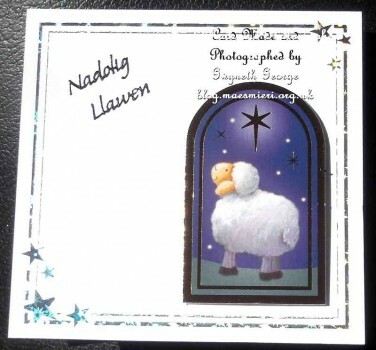 It wasn’t long before she sent me exactly what I wanted – Thank you so much Janette. Here’s the card I made, with everything cut out using Tattered Lace dies. 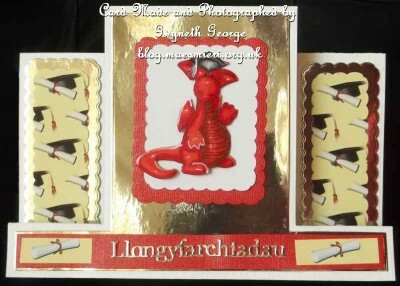 Llongyfarchiadau is Welsh for Congratulations! Angled view to show dimension. 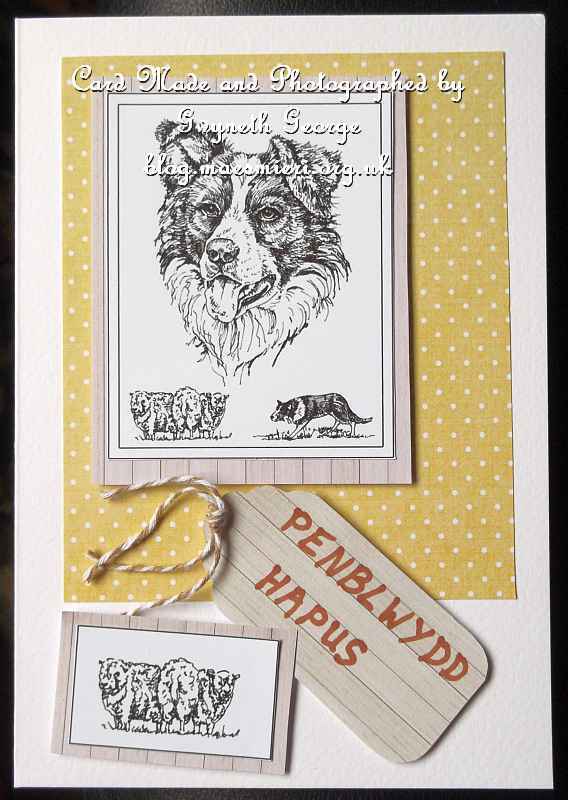 Close-up of digi-stamp – coloured with Pro-markers and Wink of Luna. 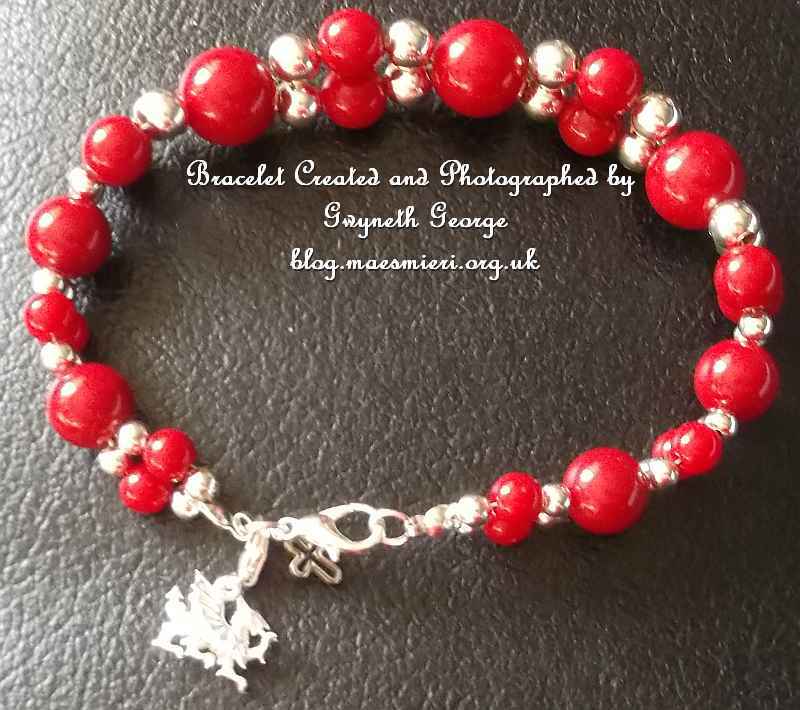 I wanted to make a little gift to go with the card, in addition to giving her a bit of money, so out came a small assortment of my jewellery making supplies and I made a red bracelet. 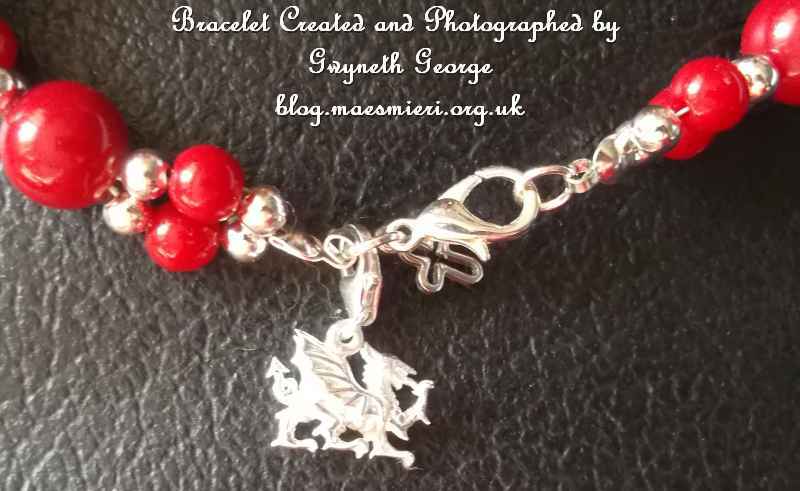 But I wanted something special to go with it and bought a sterling silver little Welsh dragon charm to attach to the bracelet. 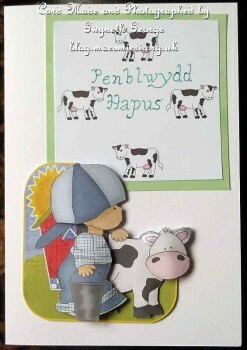 I also made another, simple, card for my parents to give my niece. 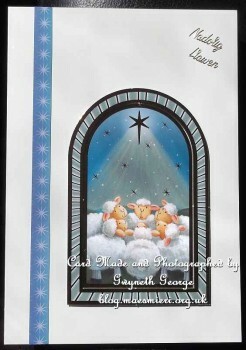 Just using some of the backgrounds from the same collection and cut using a different set of Tattered Lace dies. I left the inside back plain for my mother to write in. What can I say about the last couple of days? – my mouth is a bit better than it was, though I didn’t have a call from the dental surgery to say they could fit me in before the dentist went away, so I’ll have to wait till the middle of next week now to have the next extraction and other work done. I’m still fighting a loosing battle with the birds getting to my loganberries before me. A few days ago I was getting over a pound of fruit a day and now I’m getting around half a pound, and it’s not down to the fruit not being there – every day the ground around the loganberry canes is littered with bits of red fruit like confetti – so annoying. 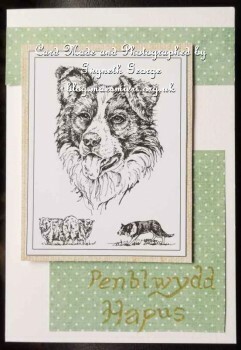 I’ve finally managed to start putting together some of the cards I cut out on my ScanNCut a week Saturday. 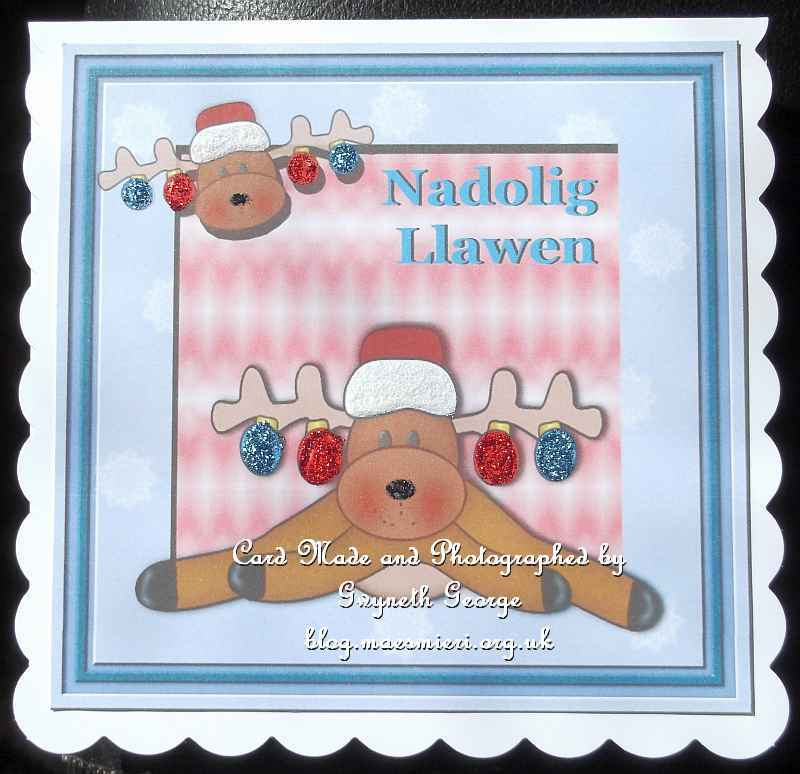 Got the first 2 to show you today, as well as some more of the quick and easy Christmas cards. I hope you like them all. For an aunt’s 90th birthday. Angled view of previous card. 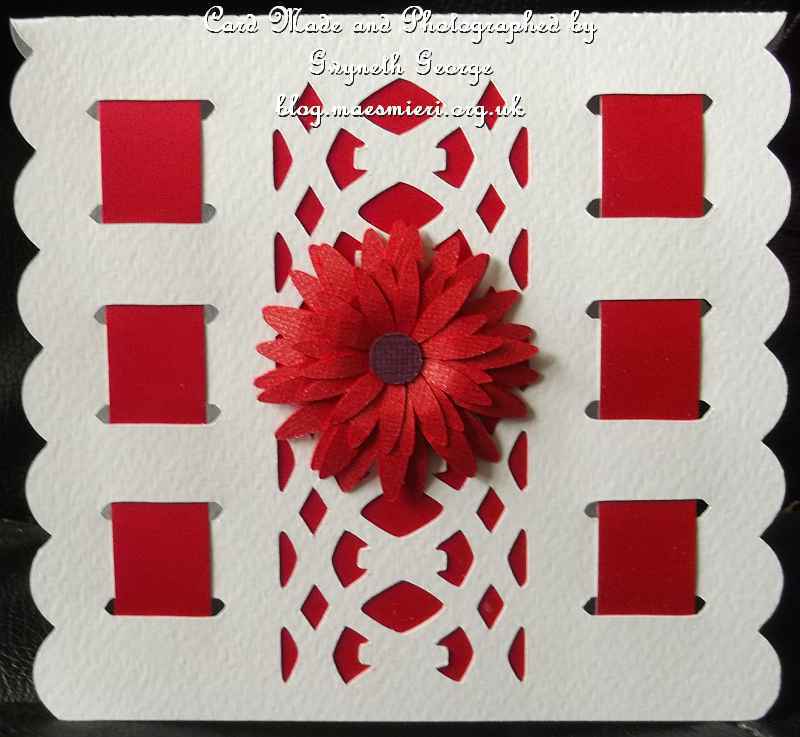 Same card at a slight angle and standing up so that you can see through the cut work better. There follows another small batch of Nativity themed Christmas Cards made using items from the same Hunkydory kit as previously. 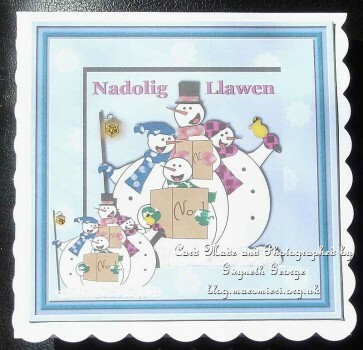 Quick and easy cards that still look nice, and even using kit elements there’s very little chance that a lot of the purchesors will create all their cards using the same layout, so individuality can be seen with cards made using kits as well. This is simply a sheet of the background cardstock, scored using my Hougie Board, and then folded in half. I then used foam tape to attach a topper and a greeting banner. 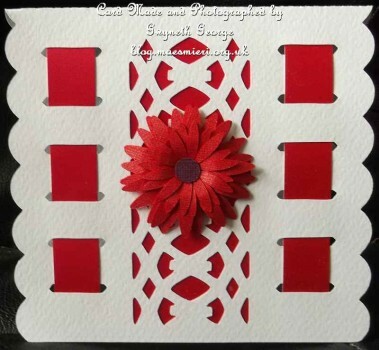 For this card I took a background sheet and scored it twice using my Hougie Board. This time I scored it to make an off-set gatefold card to show off the images on the background to their best. 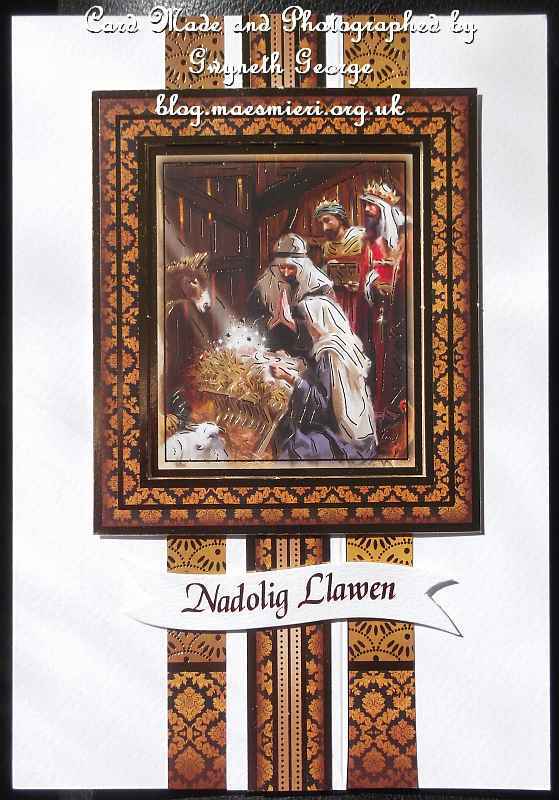 I then added a candle and a star peel-off before using foam tape to attach a greetings banner – “Nadolig Llawen” is Welsh for “Happy Christmas”. Slightly different angle’d view of the card. 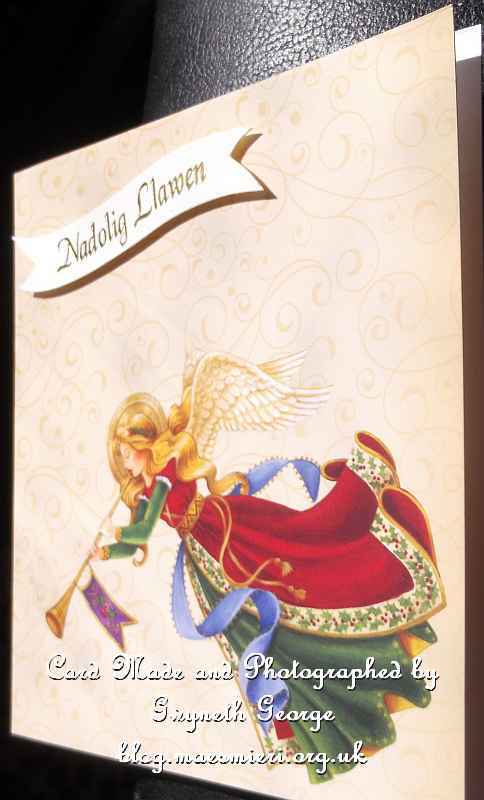 For this card I took a sheet of foiled Adorable Scorable cardstock and scored it using my Hougie Board before folding it in half. 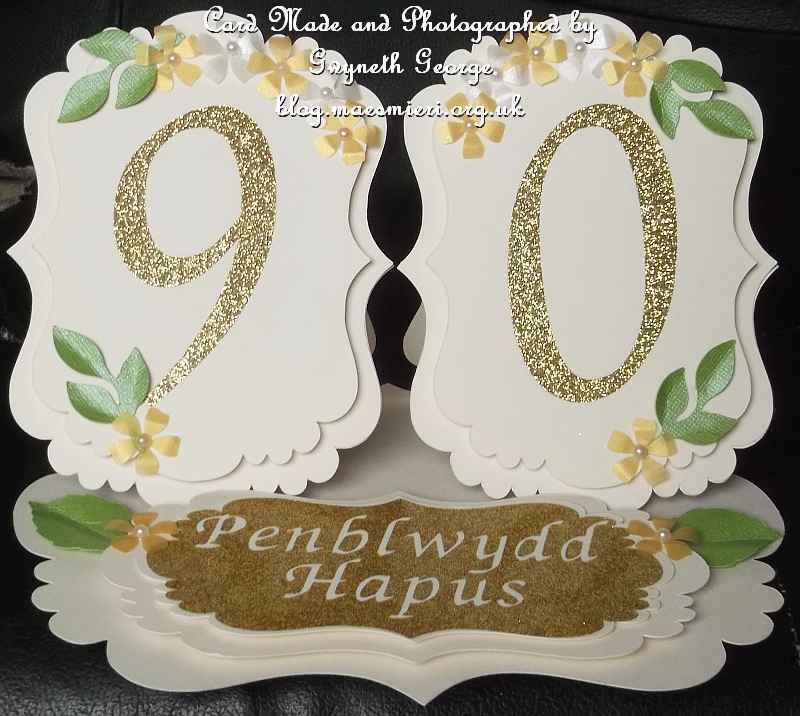 I took a piece of paper ribbon from one of the topper sheets and attached using finger-lift tape befoe using some foam tape to attach the three toppers – sorry but the light shining on this card hasn’t made the colours and images look their best in this photo. 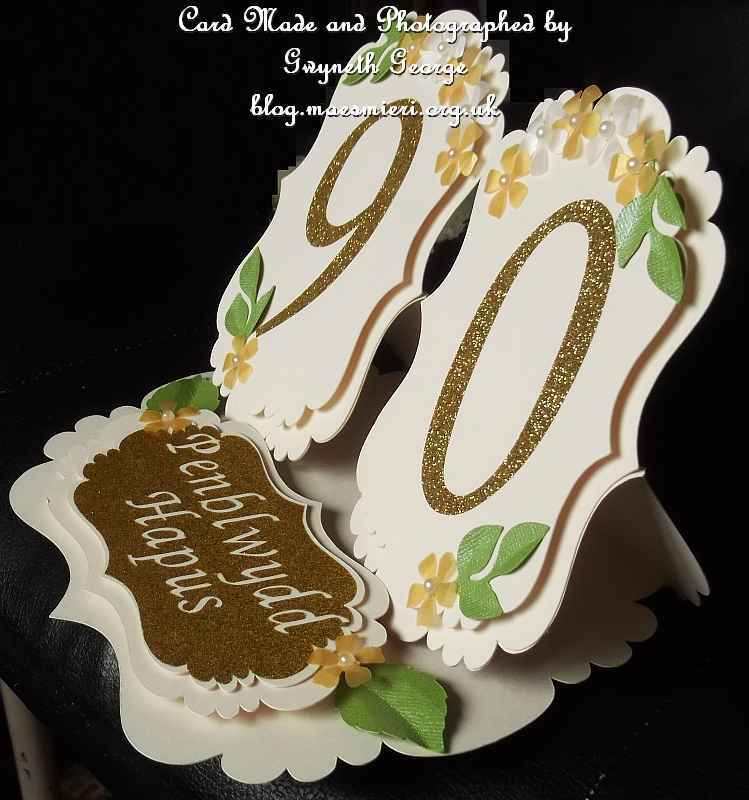 I wanted to make a larger card with this topper, so rather than scoreing it at the half way point I scored it at 8″ and 9″ and then cut it off at the 9″ line and folded at the 8″ line. 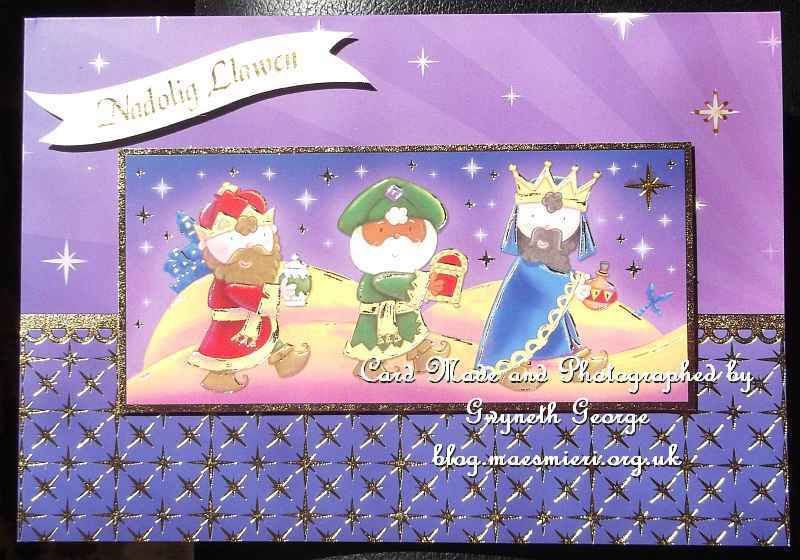 I used ultra tacky tape to attach a sheet of white hammered cardstock as a back to the card, cutting off the excess once it was firmly in place. You can find a list of all the Designers currently offering a 20% discount by clicking – Here! 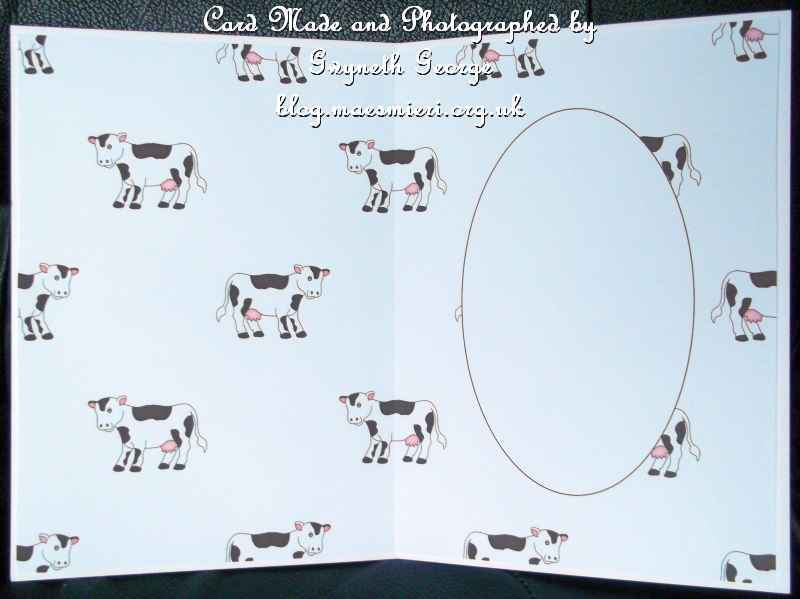 Craftsuprint have a Mailer Archive where you can go to get links to mailers sent out over the last few months. 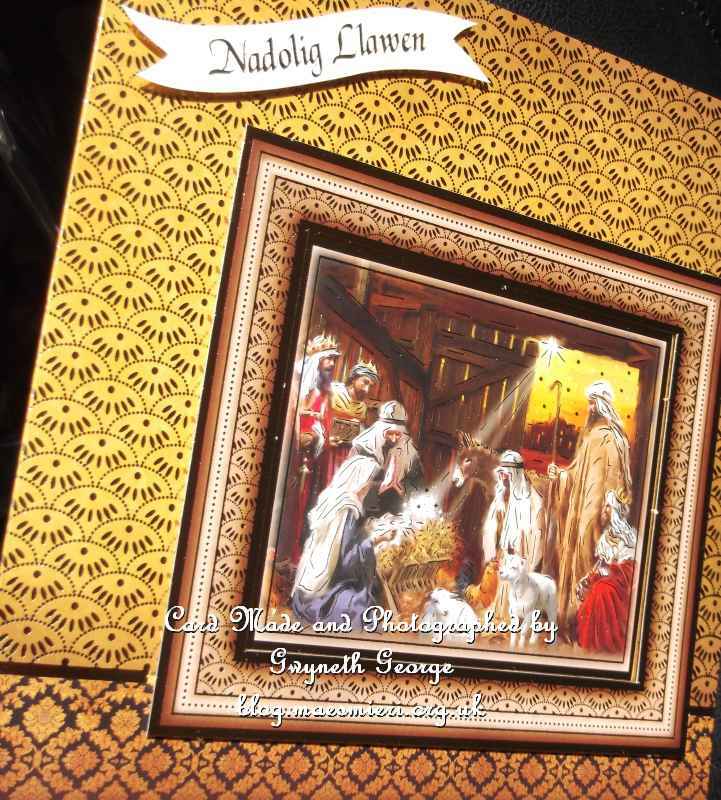 This can be seen by clicking – here. Although I’m still in a bit of pain with my mouth and the tooth extraction sites, but the pain is much better than it was and I can concentrate a bit better than I could a week ago. I’ve still got the visit back to the dentist the week after next to look forward to for more fillings and extractions, so I suspect it will be a while yet before I’m back to my regular self and my full assortment of varied crafting. I have however still been working on quick and simple projects. I hope you like what I’ve made lately. 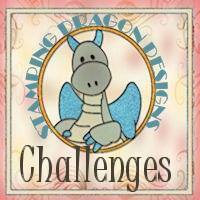 Just a reminder that there’s a challenge currently going on over on “Stampin with the Dragon“. 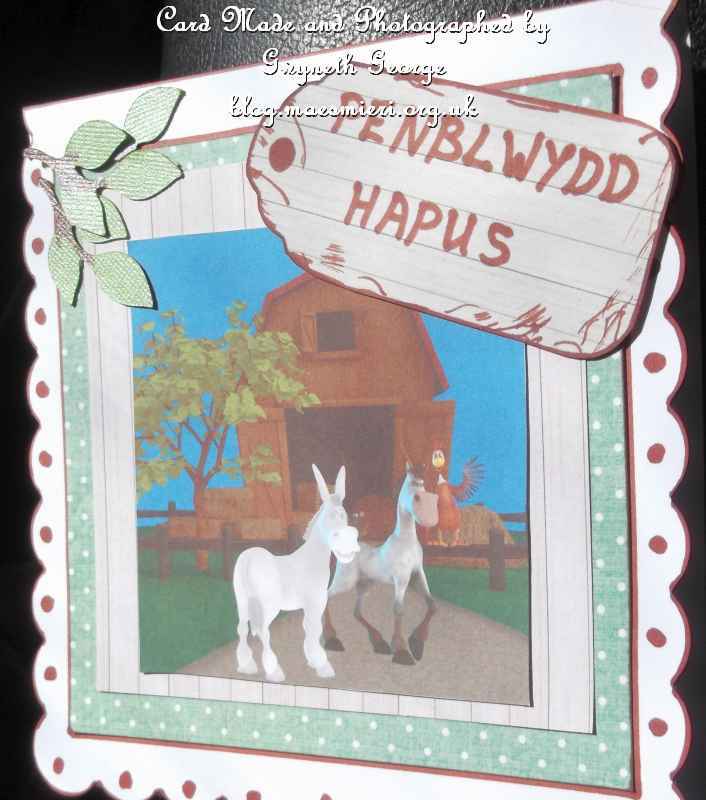 The challenge is quite simple really – just make an “Easel Card” using something from Stamping Dragon Designs on it (it would help confirm your creations eligibility if you mentioned the name of the item in your blog description to make sure that your creation isn’t disqualified in error). It doesn’t have to be made with all SDD items, just make sure you use something SDD. Read the full rules on the blog – Here! There’s a voucher to spend in the store for the winner – who gets chosen by Random from all eligable entries. 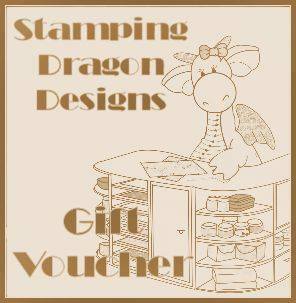 And the really good thing is that you can enter using any of the freebies that are available to the Stamping Dragon Designs Facebook group members. 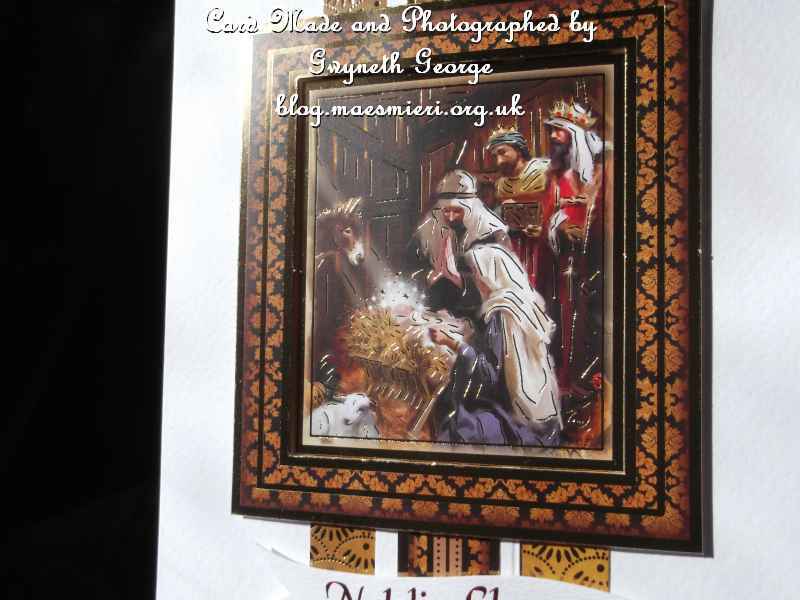 So if you are not already a member – pop over – and join us. And don’t forget to check out the Blog Candy on offer on The Dragons Den as well – Here! 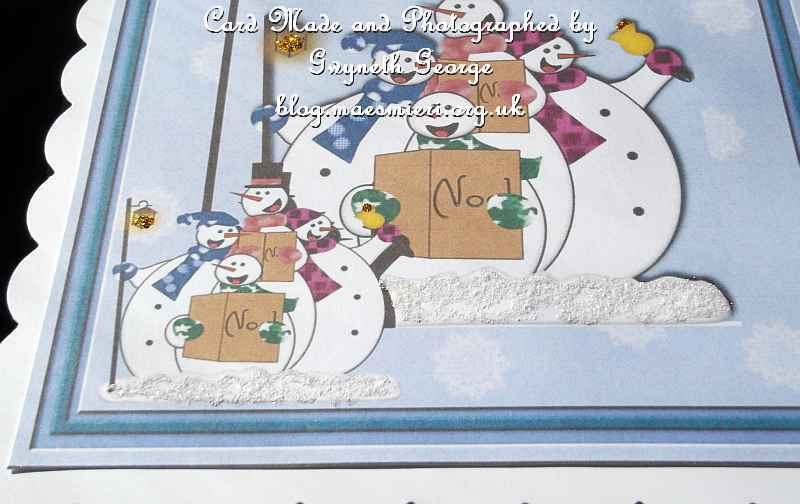 And now back to some more quick and easy Christmas cards made using elements from the same Hunkydory kit I’ve used for items in previous posts. 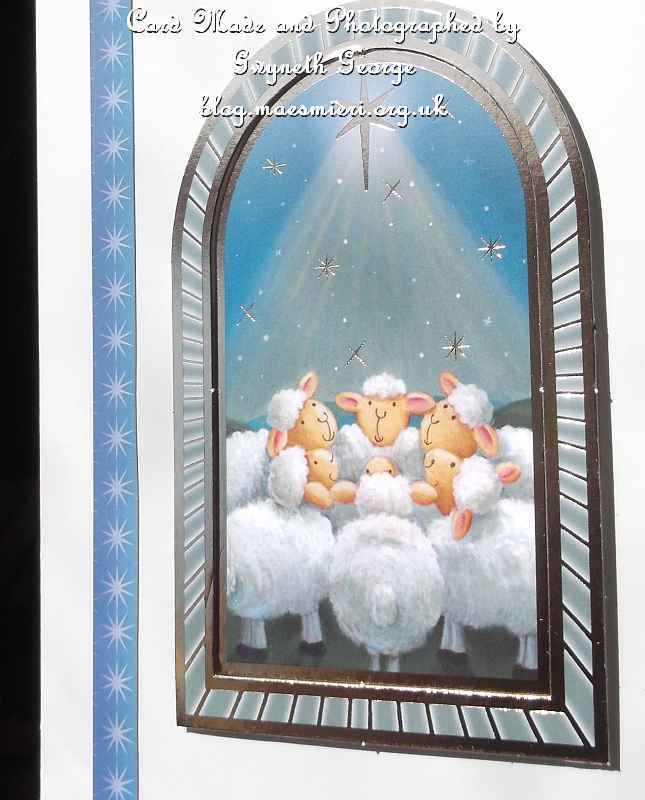 Today’s selection all feature the sheep on the hills. This is a little square pre-foiled card with just a small topper added using 2mm deep, double sided, foam tape with a peel-off greeting added to finish. 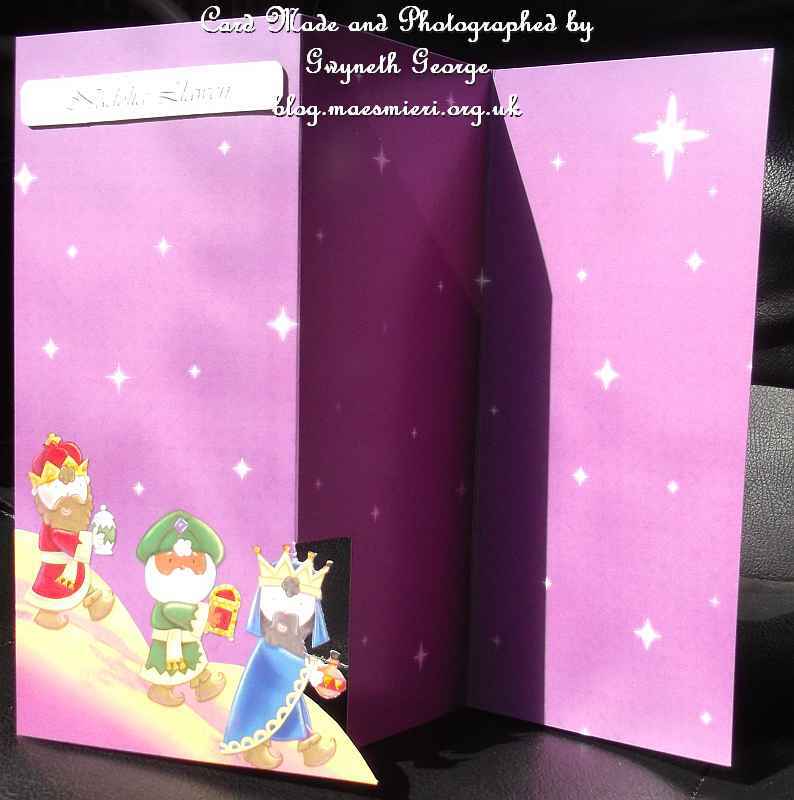 I cut one of the background cardstocks from the kit in half and stuck one half to the front of an A4 cardstock that I’d scored using my Hougie Board and folded in half. 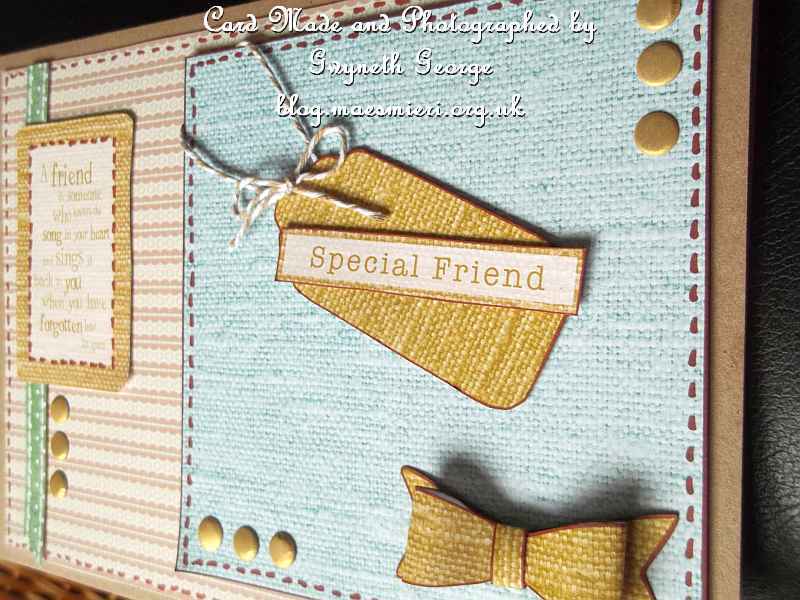 I added a sticky back foiled paper ribbon down the left hand side and then put on a greetings banner. 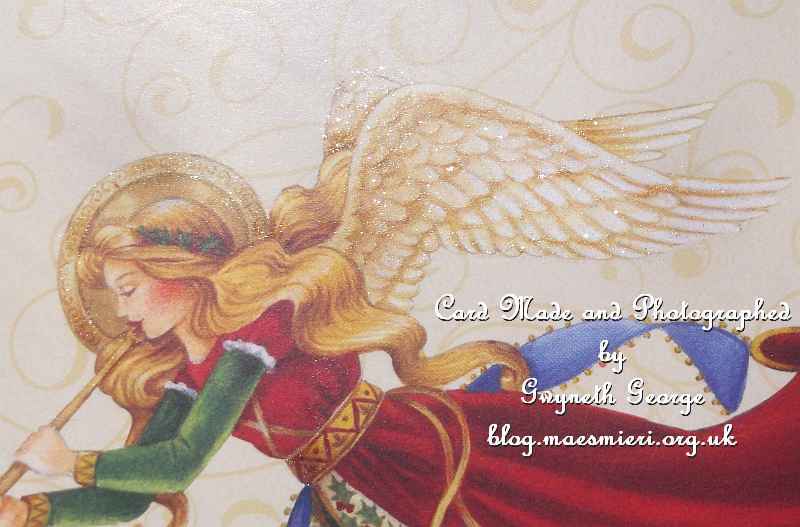 The other half of the sheet of cardstock used on the previous card was stuck to the front of another base card made a another card. 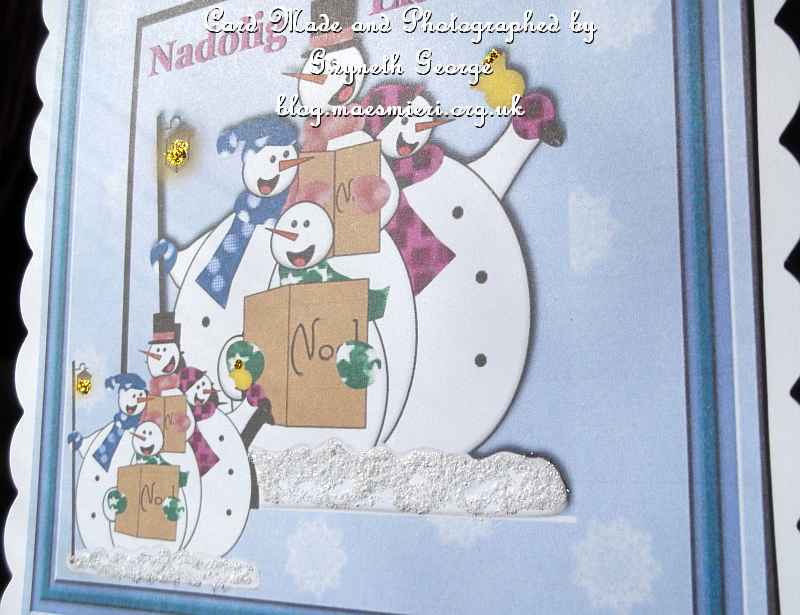 This time I added a topper and a greetings panel using 2mm deep, double sided, foam tape. 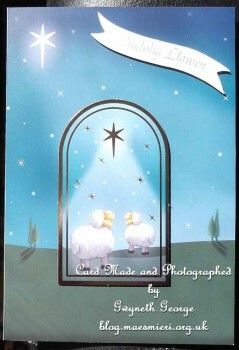 An angled view of the same card. This time I scored a sheet of A4 of Andy’s Cards cardstock using my Hougie board. 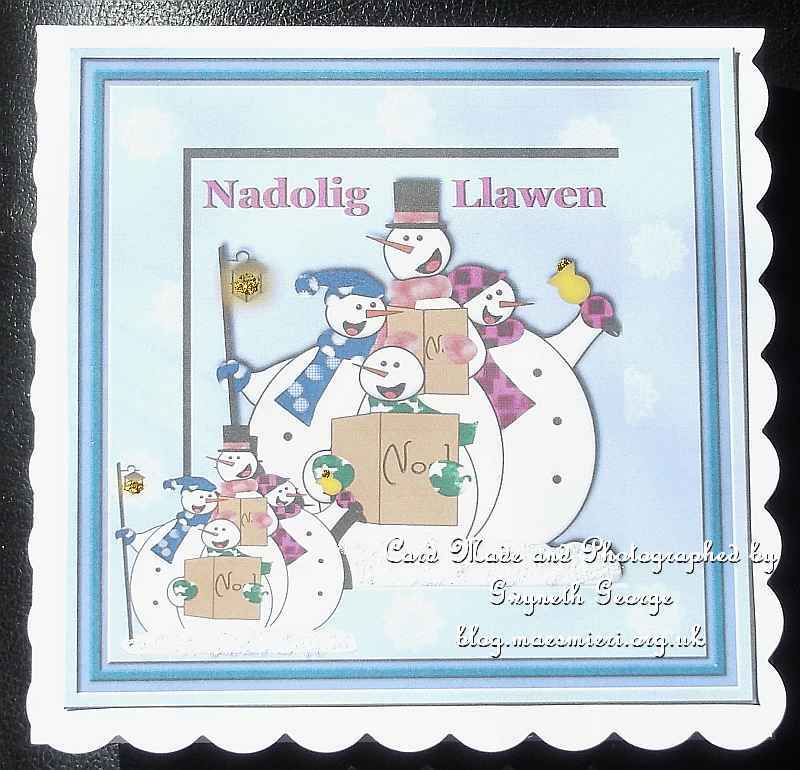 I added a piece of foiled paper ribbon near the left hand side of the card. 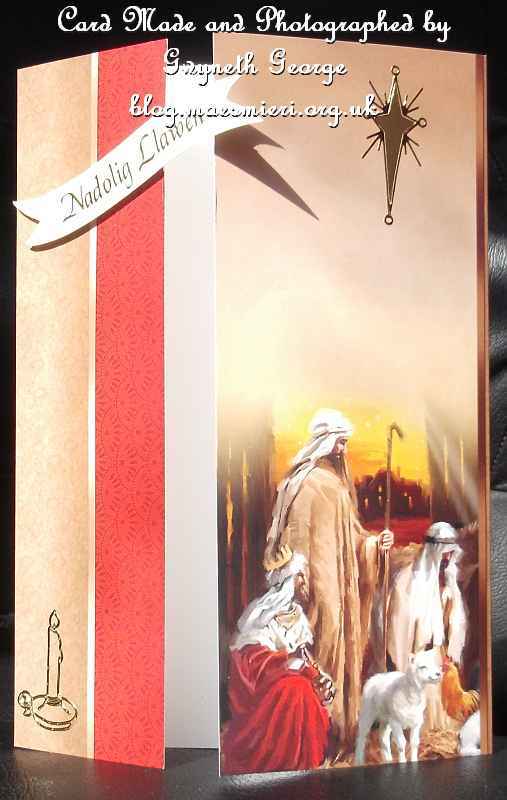 I put on the topper using finger-lift tape and used 2mm deep, double sided, foam tape to add the frame and greetings panel. 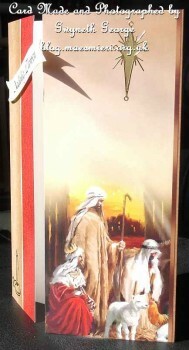 A close-up angled view of the same card. 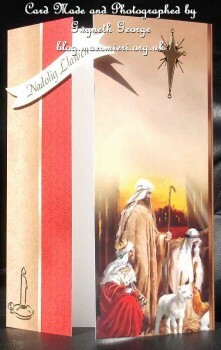 For this card I used an A4 sheet of hammered cardstock that I scored using my Hougie Board and folded in half. I added a piece of sticky back paper ribbon near the left hands side and put on my topper using fingerlift tape and the frameing element using 2mm deep, double sided, foam tape. I finished off with a peel-off greeting. 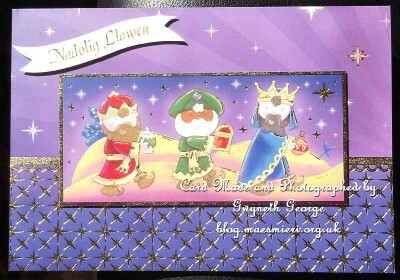 An angled view of the previous card. I think the birds got more of the blackcurrents than I did this year. Every time I looked at the bushes it didn’t look as if any more blackcurrents were ripening, I think that this was because the birds were eating them off as they were ripening every morning before I got out to the garden. In any case, I think I’ve finished picking the blackcurrents now and this is the double page spread I made. Closer look at the first page of the spread. 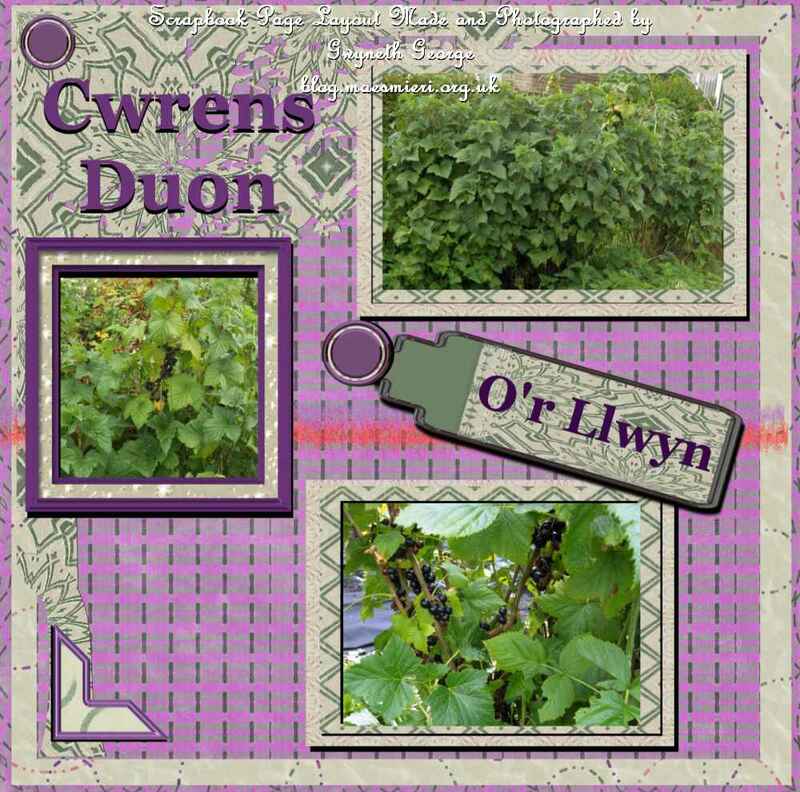 Cwrens Duon = Black Currents; O’r Llwyn = From the Bush. 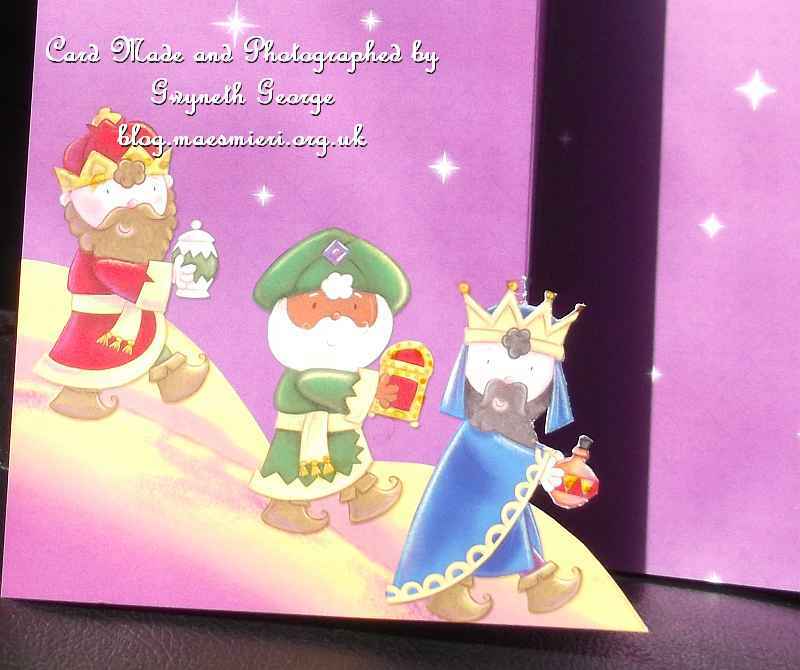 Closer look at the second page of the spread. I’r ty = To the House. 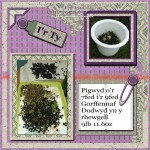 Pigwyd o’r 7fed i’r 9fed Gorffennaf = Picked between the 7th and the 9th July; Dodwyd yn y rhewgell 9lb 11.6oz = Put 9lb 11.6oz i the freezer. Remember to click on the thumbnails to see a larger version of the image! 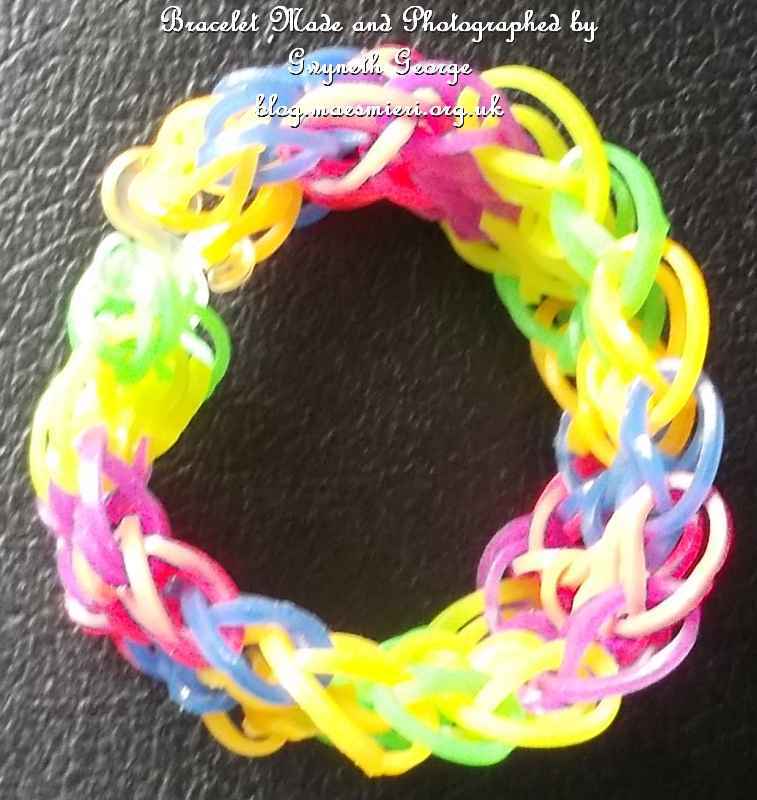 You may remember that, in a previous post, I showed you an octopus that I’d made using elastic loom bands, and the octopus changed colour when put in sunlight. Well I then got my hands on some Pony Beads that are UV Change, so change from a white/clear to coloured when they get placed in sunlight. The cuff bracelet was made using the same pattern as the cuff bracelet I showed you previously – here. 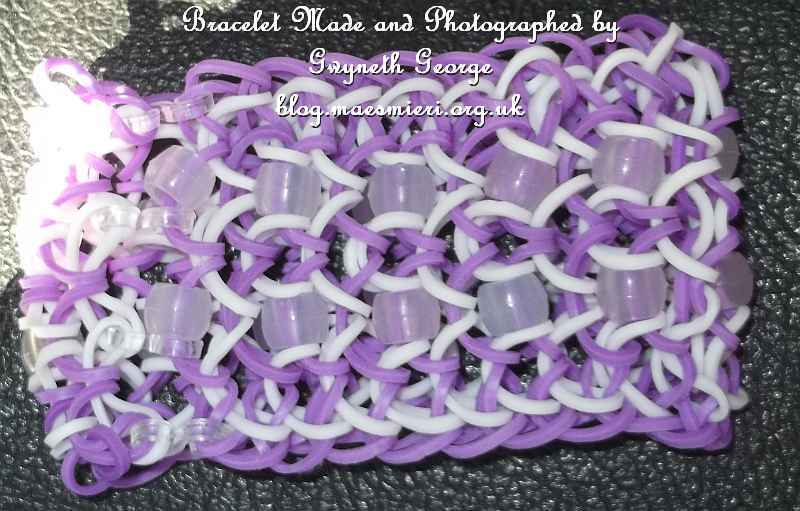 But this time I added beads to the two central bands on every other purple row before working with them. This is the cuff bracelet from the side. I’ve put it flat, in the shade, for this picture. 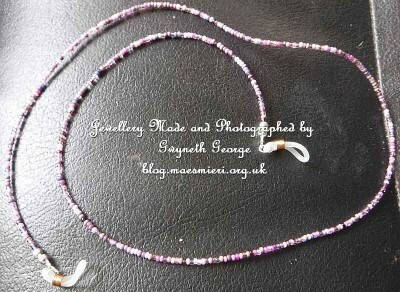 I then moved it into the sunlight and you can see the beads changeing colour in this picture. 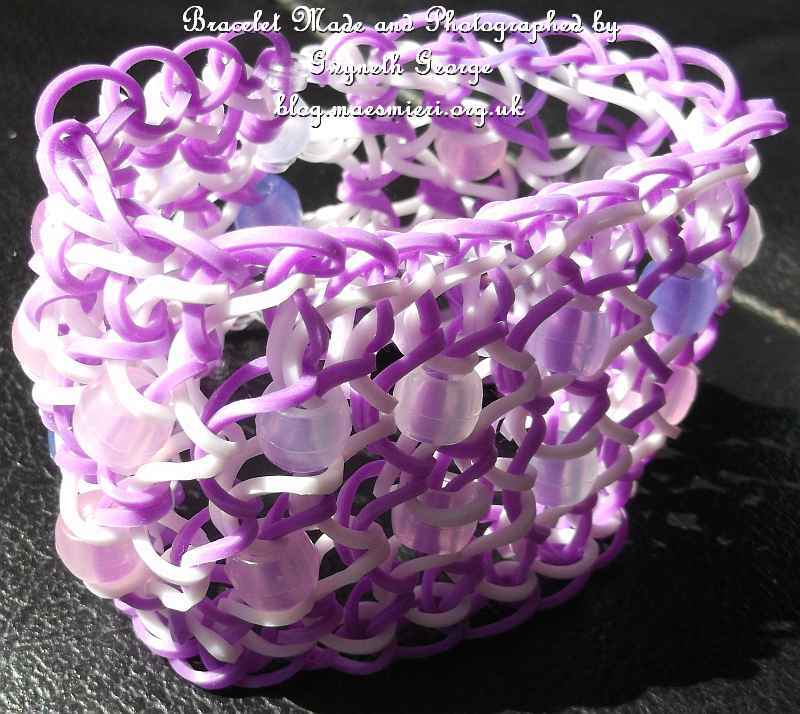 A side view of the bracelet cuff. Well I went to the dentist again on Tuesday afternoon – an appointment booked to have a small filling replaced in one of my front teeth. The good news is that I didn’t have an injection, filling or extraction – though really that’s the bad news, because by the time she’d prodded and poked and taken three X-rays of the two teeth that had been giving me problems during the period since I had the two extractions a week previously, the short time slot I was booked in for the filling was over. I was right that the pain I’ve been in this last week is down to more than the two extractions I had done a week ago – the teeth directly behind both the extractions both have lost fillings. X-rays showed that one has a rotten core down to the bone and will have to come out. The other is more painful at the moment because the nerve is exposed. So all she had time for was to put in a temporary dressing that should stop the sensitivity until my next appointment in a fortninghts time. So back home via the shop to pick up more painkillers and another lie down to try and recover from the little excursion. Unfortunately the dentist is away next week so no appointments available until the following week. The dental nurse has already put me on the list to have a call in if anybody cancels in the meantime. At least with the temporary dressing in place the pain killer are working better, which is more than the were doing, so I’m feeling reasonable even if I’m not feeling good at the moment. But the birds wait for nobody, so I’ve had to battle on and pick what blackcurrants were left – not nearly as big a crop as I’d have hoped to get but I knew that the blackbirds and probably other birds were getting there before me every morning. Did a push early Wednesday morning and got all the ones I could still see on the bushes. And I’m still getting some Loganberries ripening every day so hopefully we’ll have a few more pounds of those to put in the freezer before they finish cropping. 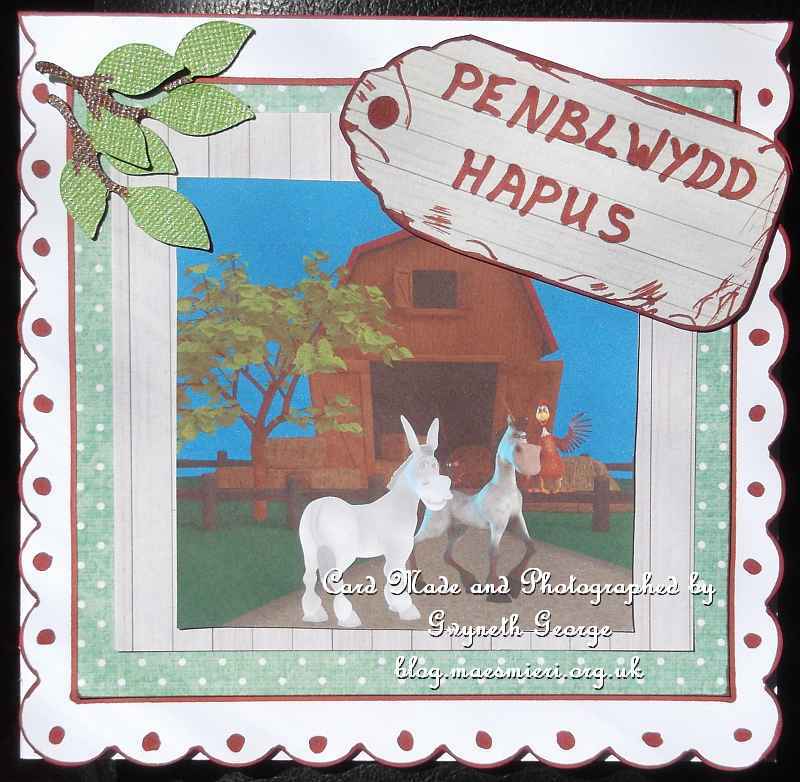 Digital Scrapbook page layouts showing these will be appearing on my blog over the next few weeks as I get them done. 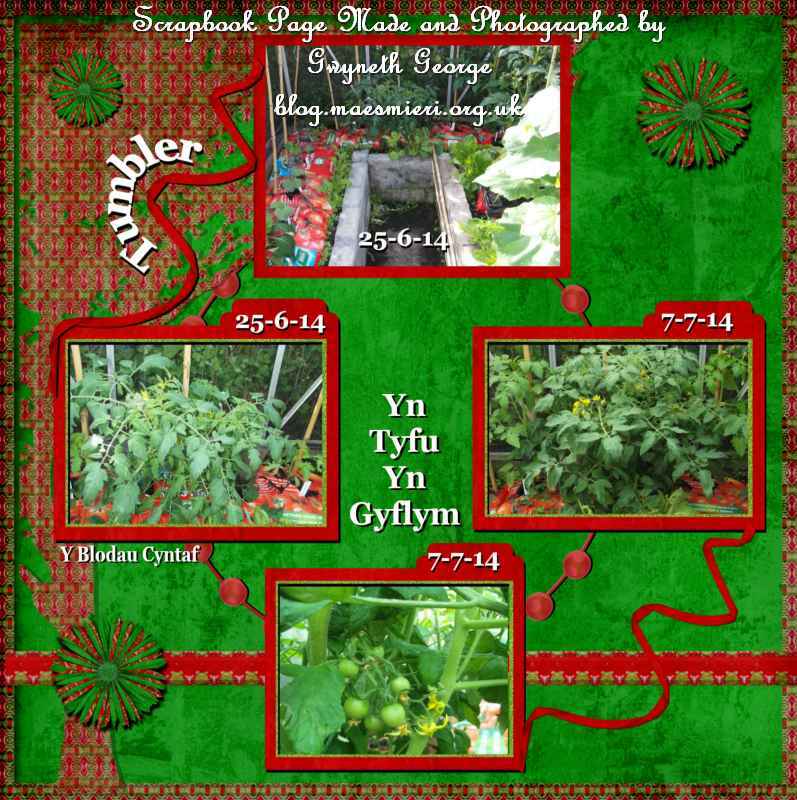 The other stuff I’ve sown and planted are also comming along slowly, so today I’ve got some more digital Scrapbook layouts of photos from the garden to show you, as well as some more quick and simple Christmas cards.. At least the bundle of Christmas cards is growing. 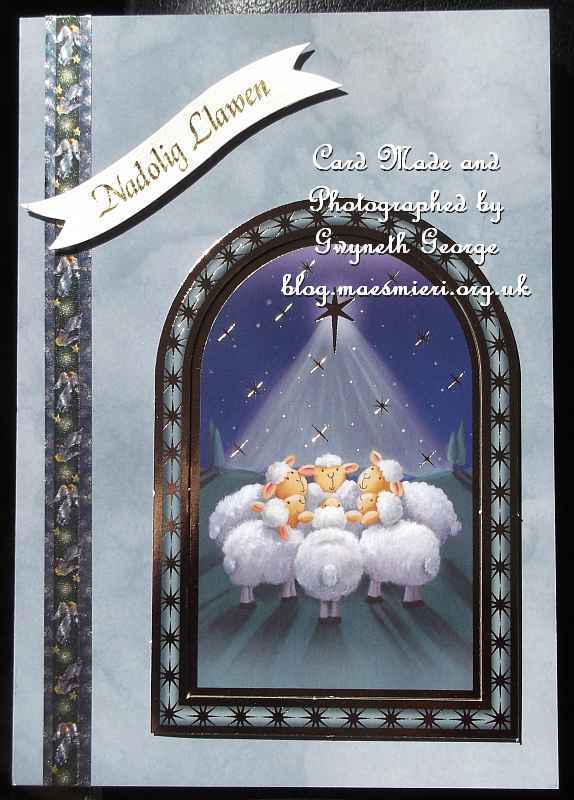 While I’ve gone for quick and easy Nativity Christmas cards for the majority of todays cards, the first two are more whimsical. 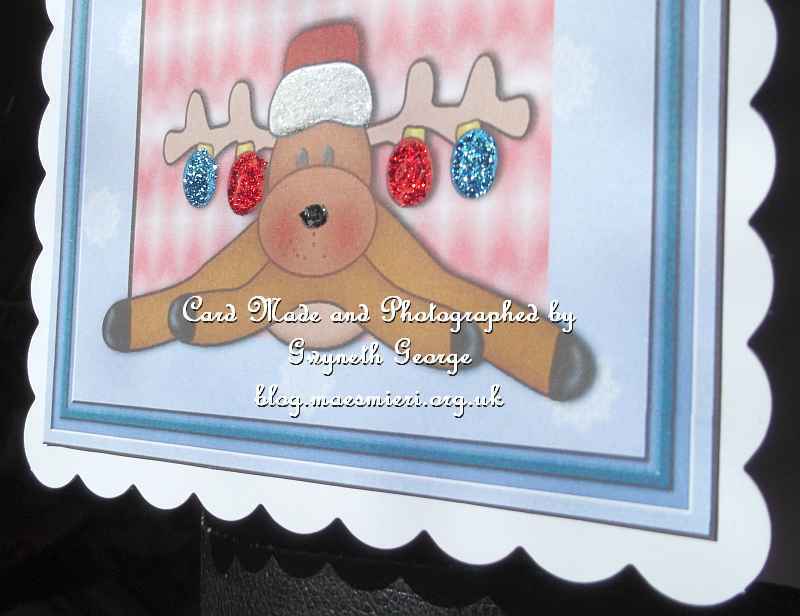 Angled view of part of the card to show the sparkle achieved using the glitter glue. 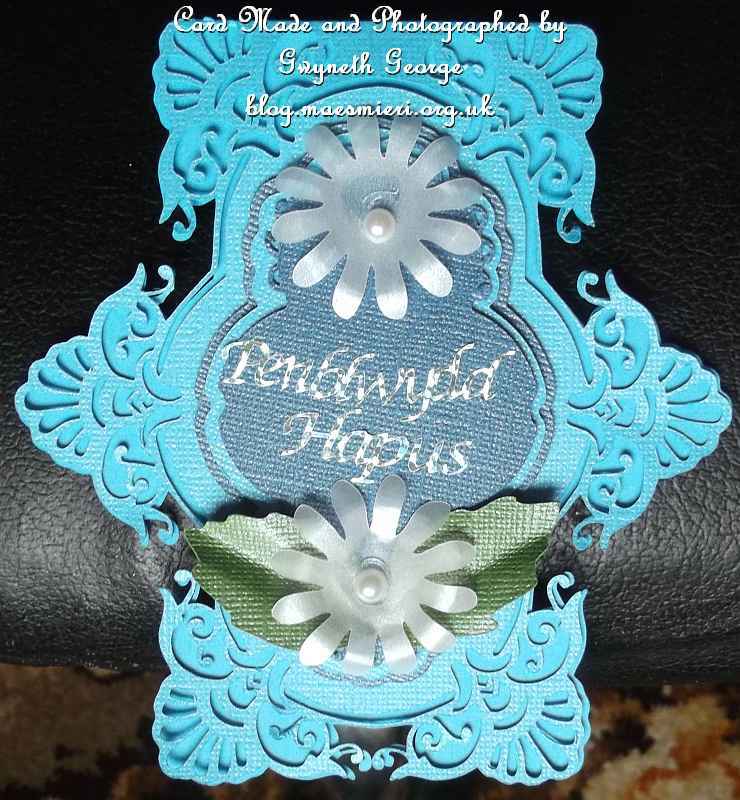 Closer, angled, look at part of the card. These are more cards I’ve made using the same Hunkydory Christmas kit as I’ve shown you previously, but this time I decided to go through the kit and pull out some of the toppers and background cards that had more of a Nativity theme to them. I hope you like them. 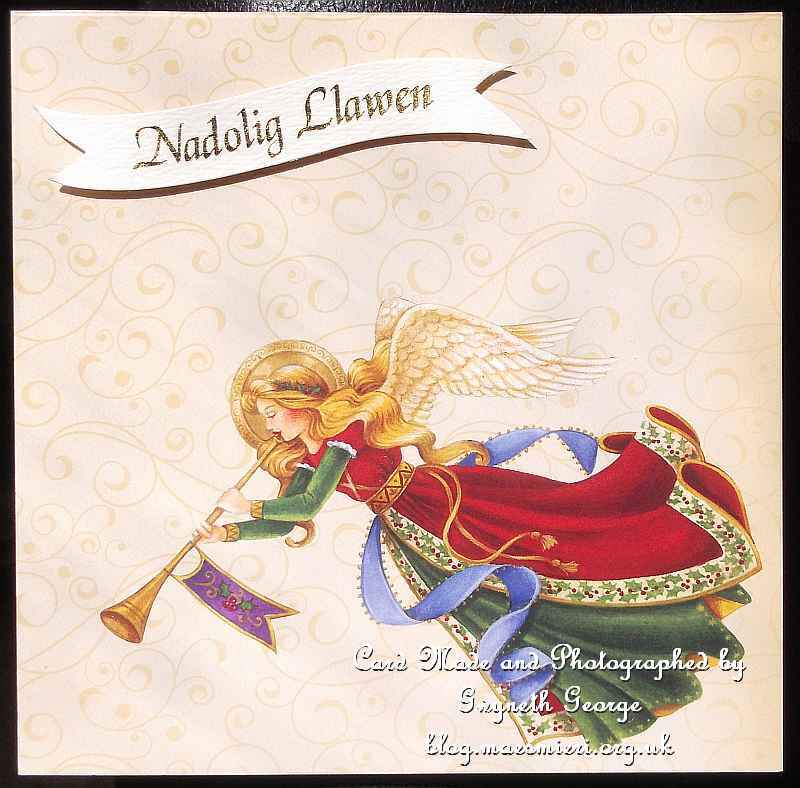 For this card I took a sheet of A4 background from the kit and scored it and cut off a piece to make it into a 6″ square card. I went over areas of the image such as the wings with clear Wink of Stella brush pen, and added the greeting banner using 2mm deep, double sided, foam tape. 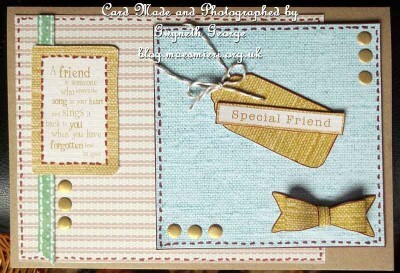 An angled view to sow that I’ve kept the card dimension down. 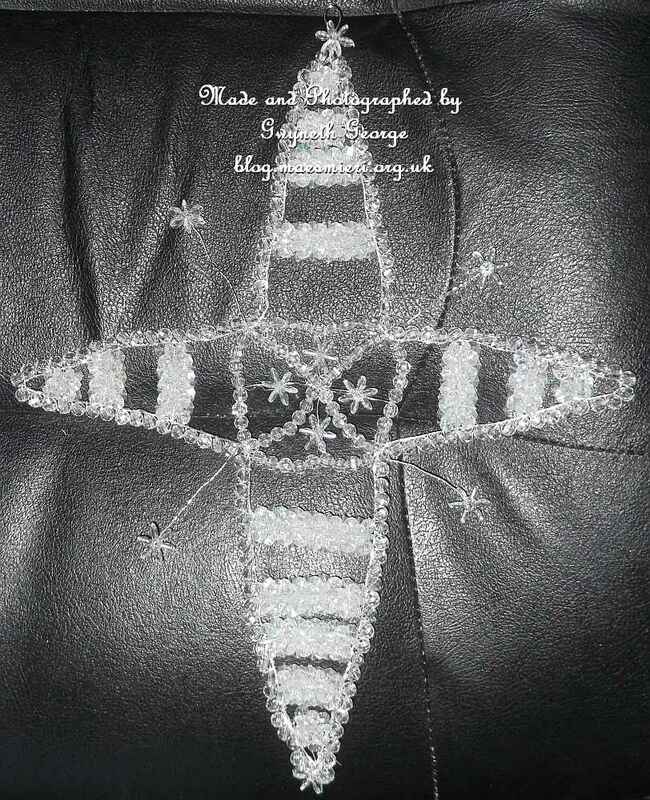 A closer look at the wing and halo area to try and show some of the sparkle added. 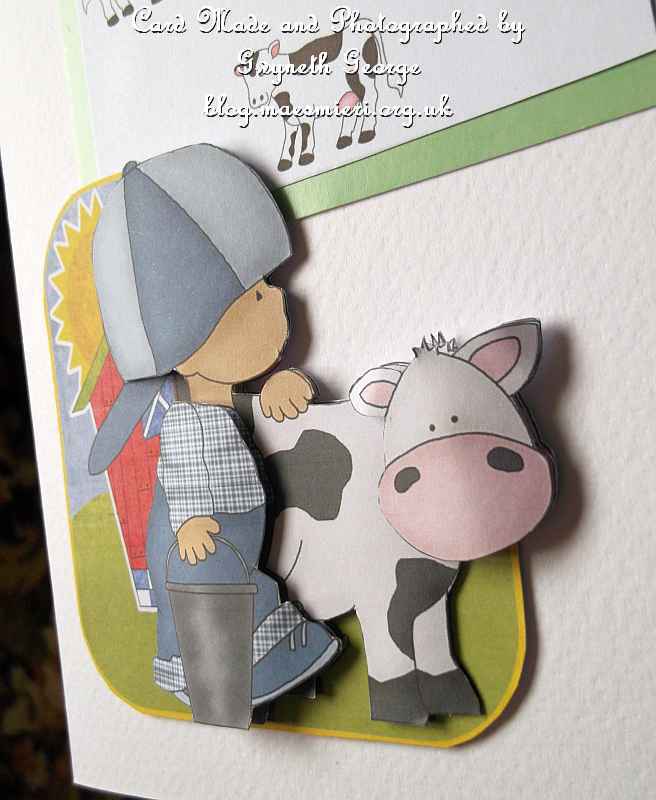 For this card I used a part of one of the backgrounds and stuck it to a plain cardstock to make the base card. I then used small strips of 2mm deep, double sided, foam tape to attach the frame element and greetings banner, and glue gel to attach the central topper and the four corners. Using glue gel like this meant I had time to slide the pieces into place. 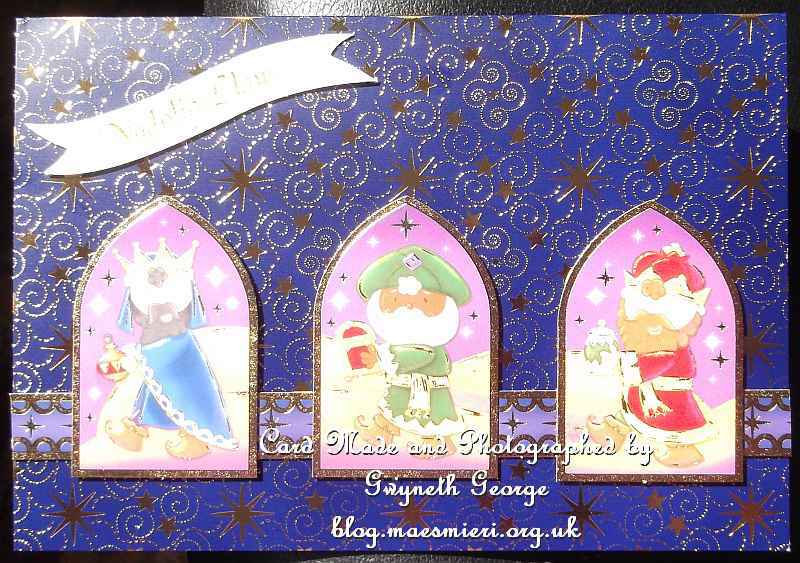 A closer, angled, view at part of the card. 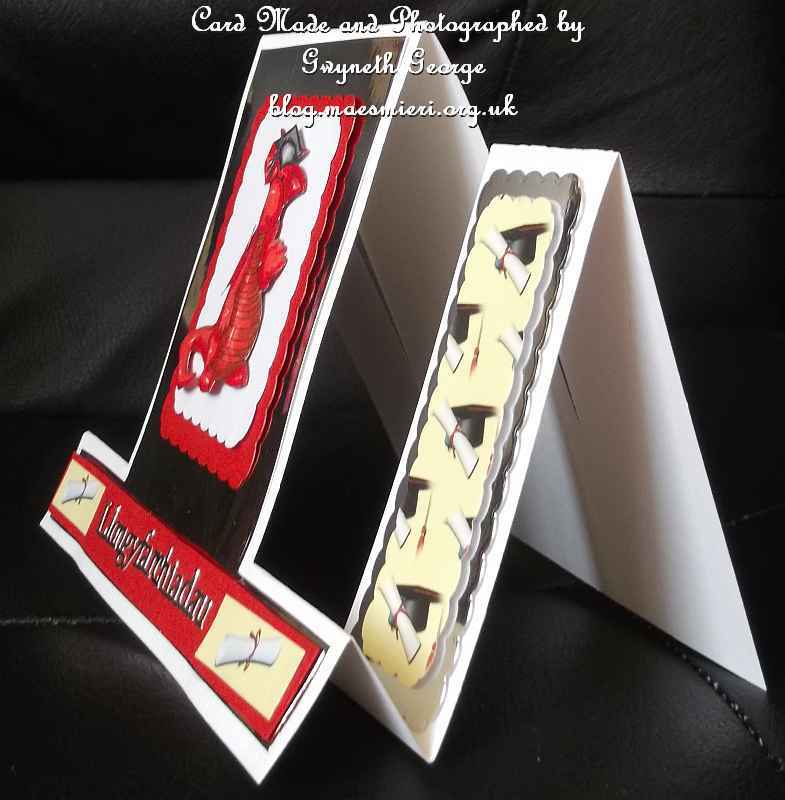 The base card is an A4 sheet of Hammered cardstock from my crafting stash that I scored using my Hougie Board and folded in half. 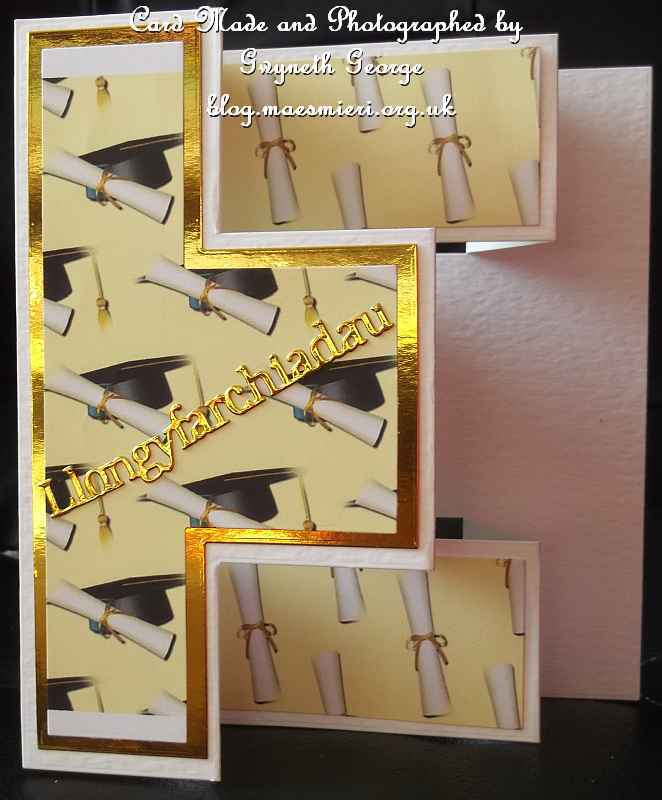 I used one of the paper ribbon elements from one of the topper sheets as well as two strips cut off one of the background cards in the kit to give some interest to the card before using 2mm deep, double sided foam tape to attach the frame and the the greetings panel. I then put in the topper using glue gel as a flat glue just to give me time to make sure it was in place central to the frame. 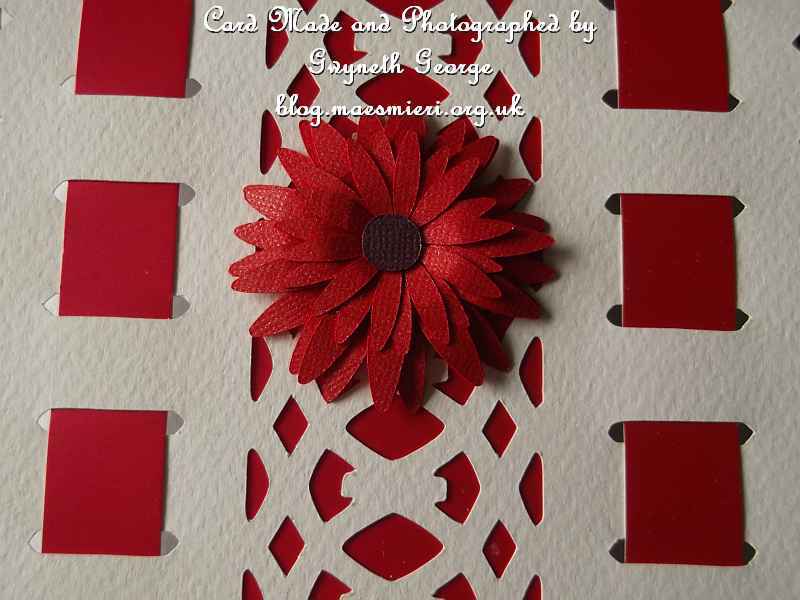 An angled view of the card front to try and show where I’d introduced a little dimension while still keeping the card flat enough to go through the UK post on a standard letter stamp. 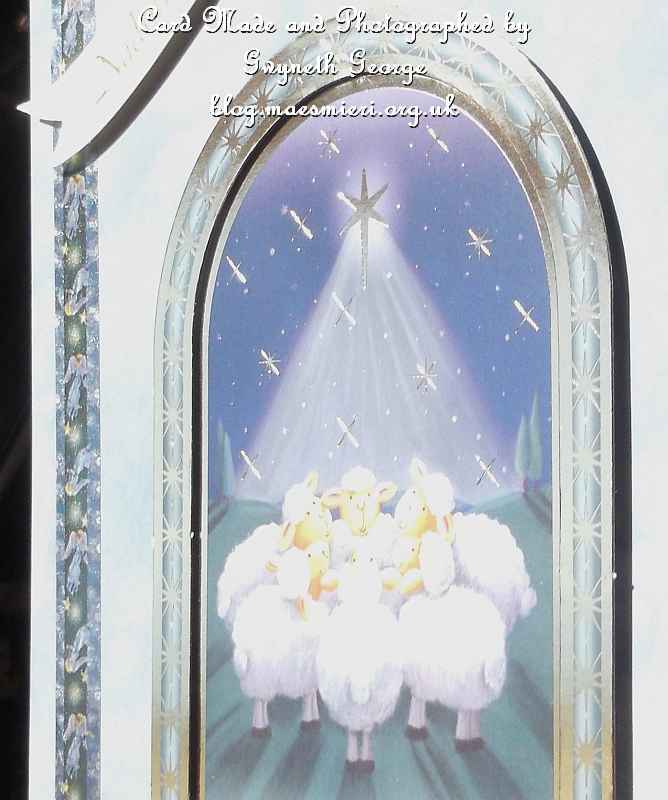 A closer look at the Nativity scene topper. This is just one of the background cards from the kit that I scored to give three equal panels, taking care not to score through the image of the wise man. 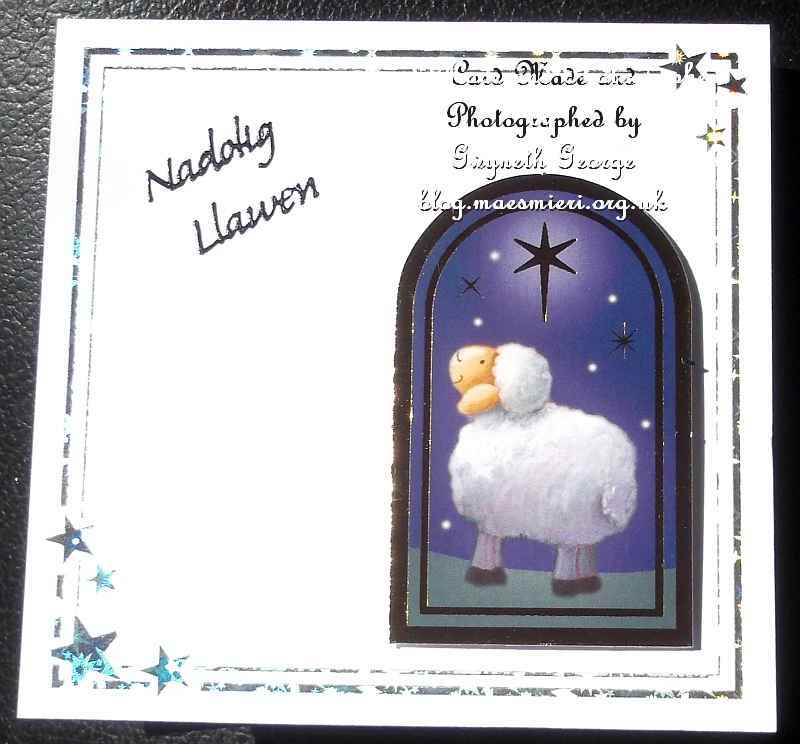 I then cut around the edge of the image before folding the card back. 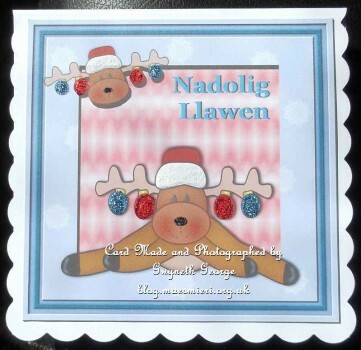 I put on a greetings banner on the front and a large star peel-off on the back. 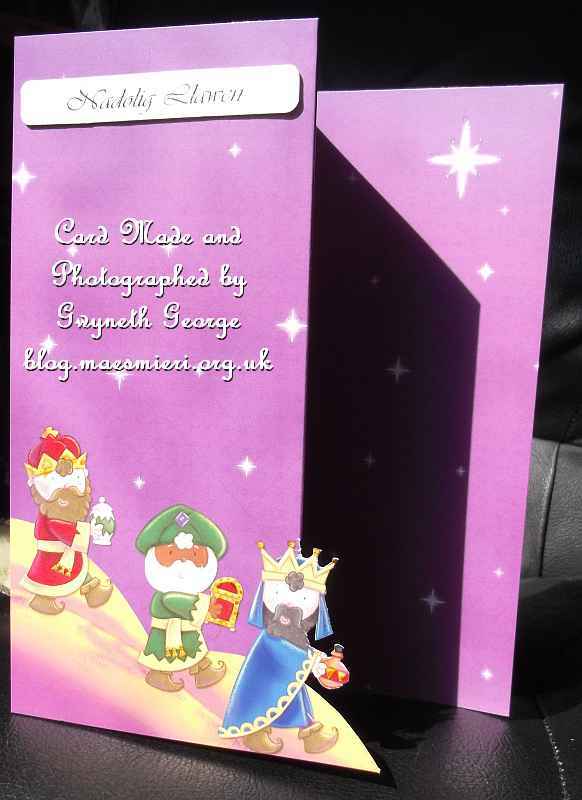 A different angled look at the card. 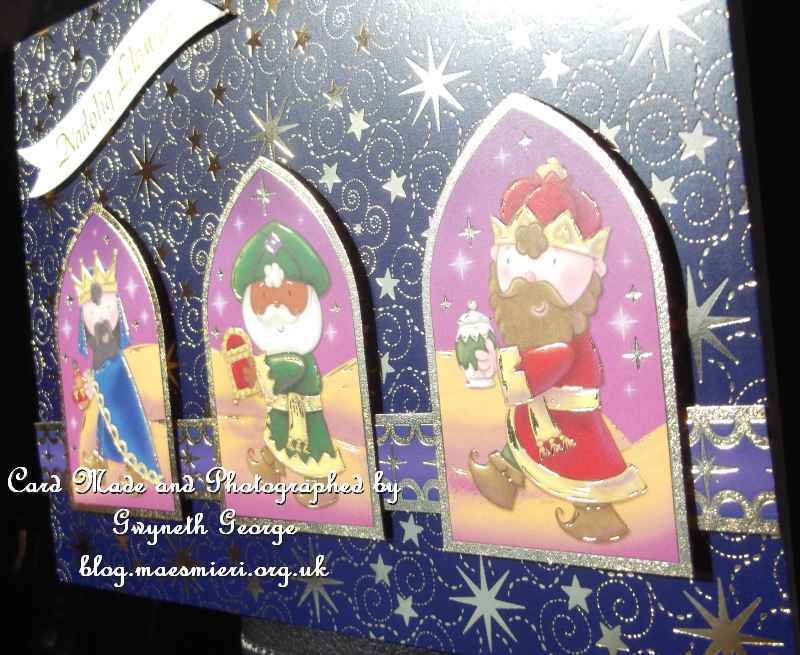 A closer look at the wise men. This page is showing the development of one of my tomato plants – the label on the plant when I got it said it is a “Tumbler” tomato plant – so it is a spreading and falling down over an edge breed of tomato rather than one that is tied in to a cane and growing upright. The base of this bracelet is a piece of black leather. 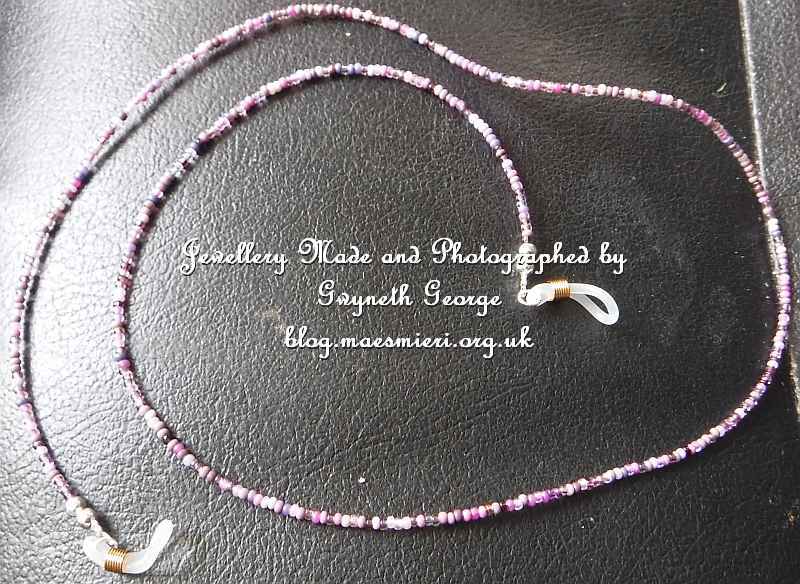 I’ve used a clear jewellery thread to attach the string of diamantes also the blue beads to this. The sparkle of the gems isn’t visible from the side like this. This side view gives you more of an idea of what the beads look like. 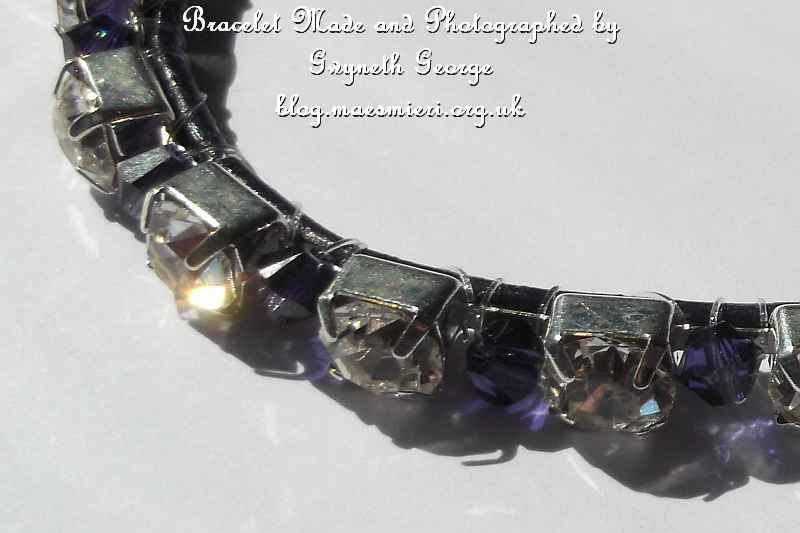 Closer look at the beads – it’s difficult to show in a photo how sparkly they look in the light. I wish I could say that my mouth and face feels a lot better after having the two teeth extracted last week, but it doesn’t actually feel a whole lot better, just a little bit better. I’m still not able to sleep all night as the last pain killers of the night ware off before the morning and if I turn onto my cheak the pain wakes me up. And today I have another appointment with the dentist for a filling – I just hope that goes according to plan and nothing movers where it shouldn’t. I’ll get her to check the hole where one of the teeth came out of, and the tooth next to it that’s been giving me about as much grief as the extraction site itself, while I’m there this afternoon. 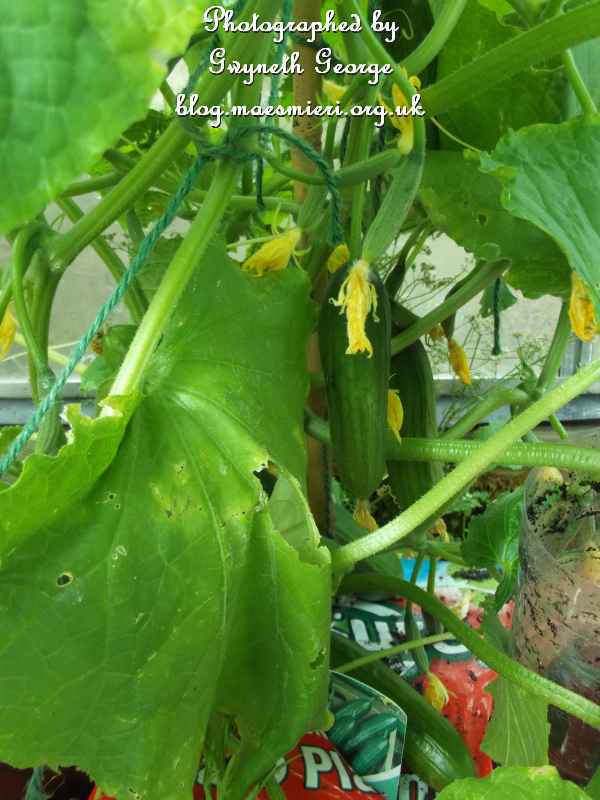 I’ve been trying to do a little bit out the garden each day as the weather has been good and the fruit is ripening well – and the blackbirds have started attacking them. You may remember that last year one of my nephews and myself made a “Scare Faces” called “Jack and Jill” (see them – here – on my old blog post if you missed them). It got wet and the weight of the wet hair pulled it down off its string the end of last summer, but it was basicly in good shape, so “Jack and Jill” have been given a new piece of string, and some glue from my hot glue gun to cover the hole of the old string, and are now hanging out between the Loganberries and Blackcurrants. I hope it has some effect in detering the birds until I get some more of the crop in. Today I’ve got a wide assortment of items to show you. I do hope you like them. 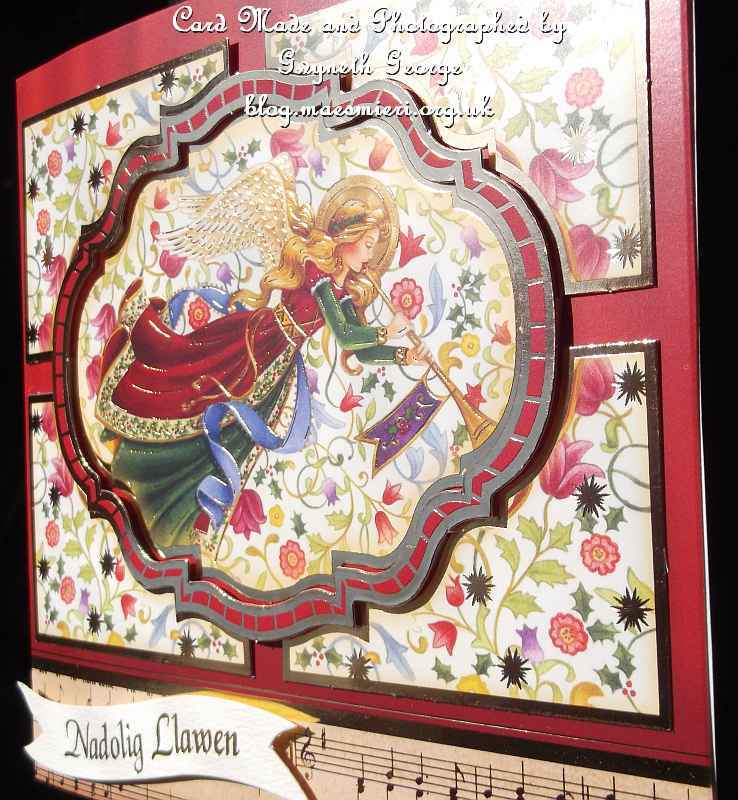 Linda’s Crafty Piece of Heaven is offering Blog Candy. 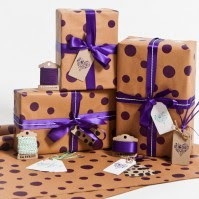 The details of what you need to do to be in with a chance of winning one of 3 surprises can be found on the blog – which you can find by clicking -> Here! 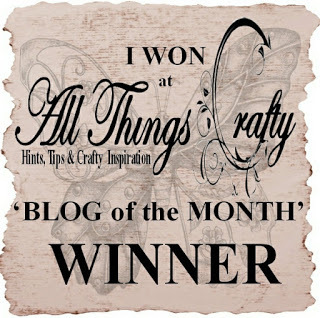 I’ve been very lucky in winning one of the blog candies that were on offer on “JUDITH’S ADORABLE CREATIONS” blog last month. A BIG THANK YOU to Judith for her generosity. I got a 10 dollar Gift Certificate to the Robyn’s Fetish site and promptly spent it on 4 lovely digi-stamps. 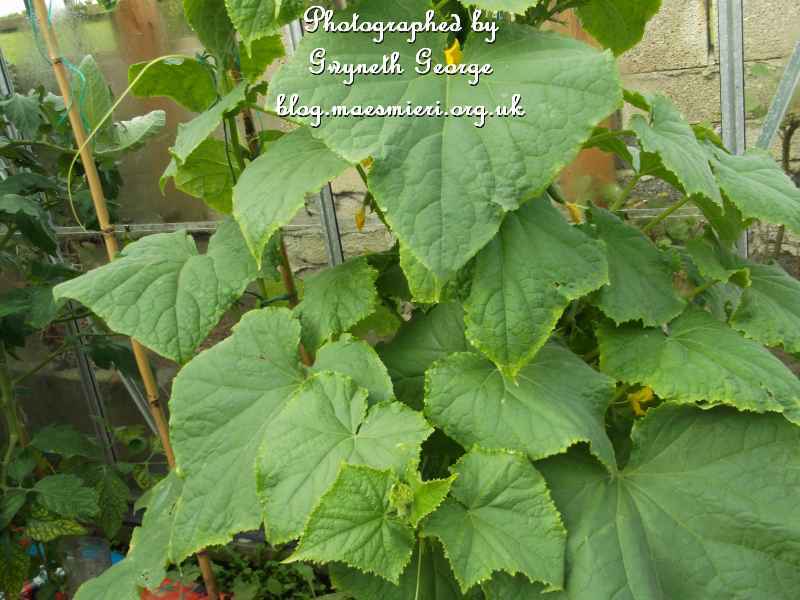 I’ve no doubt, once I’m feeling better, and once the rush of the summer gardening is over, you’ll be seeing some of them appearing in my creations on my blog. The first two cards were made to give to two male family members on their birthdays lately. 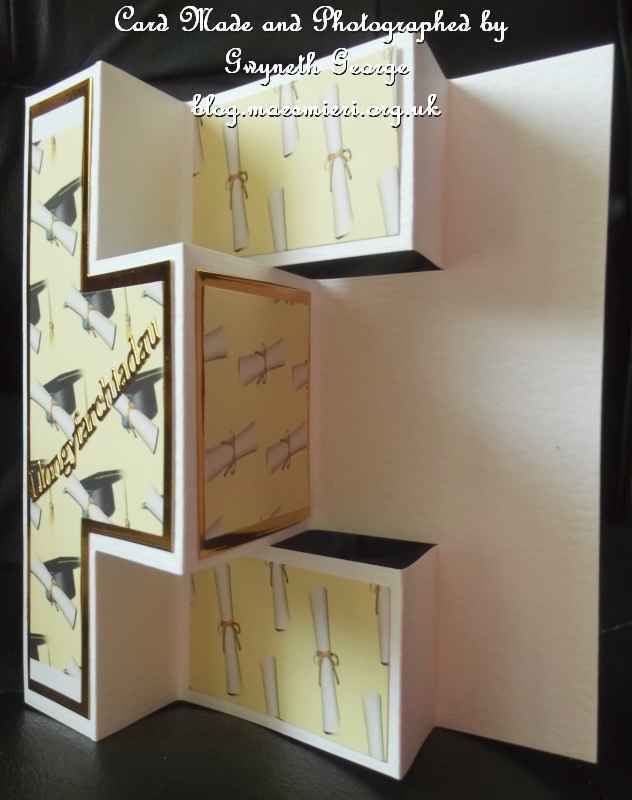 Angled view to show the small dimension I built on the card. I’ve got a couple more loom elastic band bracelets to show you today. Both are made in the same pattern but I’m not sure what it’s called – could be fish scales or dragon’s skin or something like that. 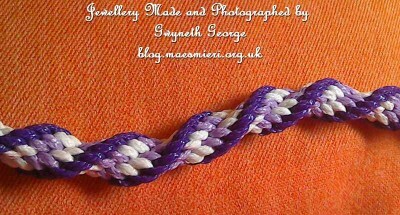 One is made over 8 pegs and one over 6 and the colour combinations used are different. 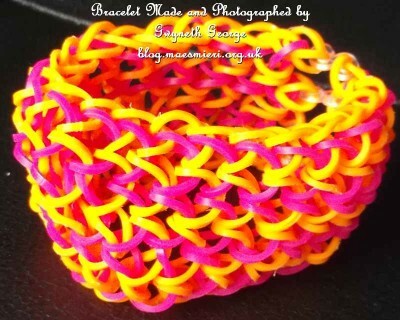 This cuff bracelet is made over 8 pegs and is made using orange and pink flurescent elastics. I’ve kept the same colours to the same pegs throughout so that the colour pattern carries through all the way. 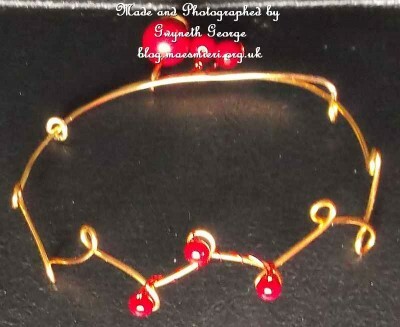 Another view of the bracelet. 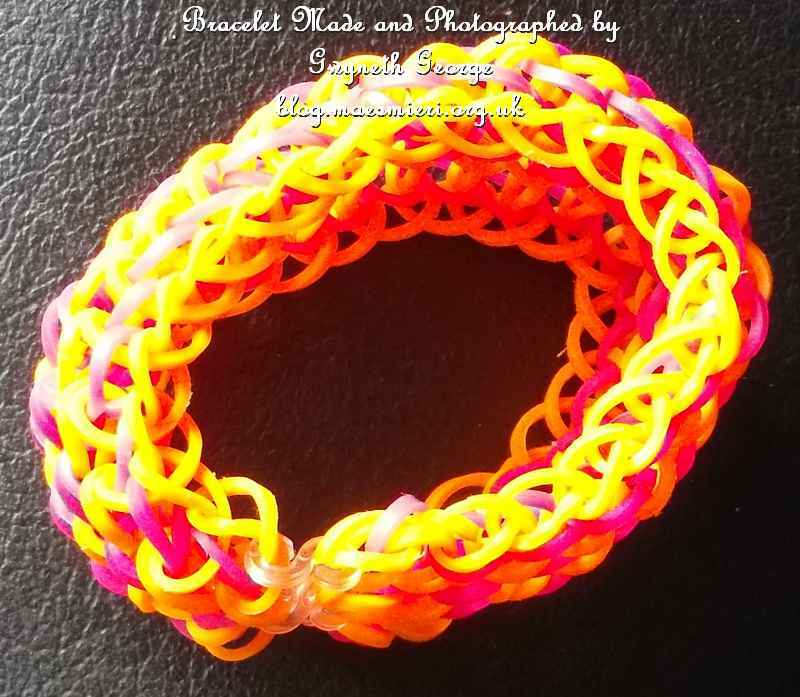 This one is made over 6 pegs and I did a whole row of one colour before moving on to another colour, so the cuff bracelet has become a rainbow of colours. 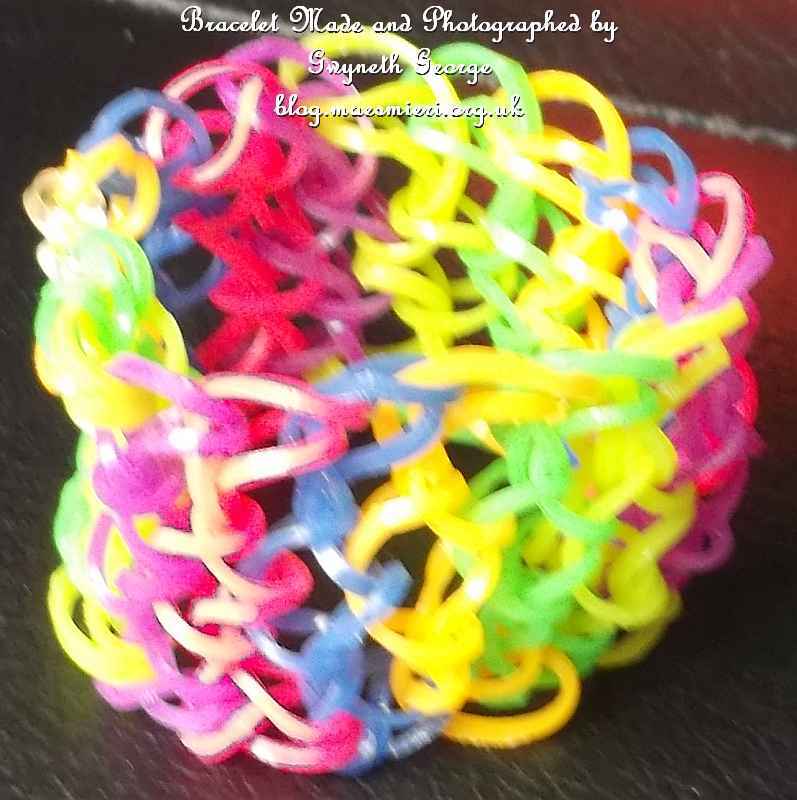 Another view of the same bracelet – sorry that these photos are not as focused as they should be. I think the different neon colours I used just sent my camera wild. More of my gardening efforts. 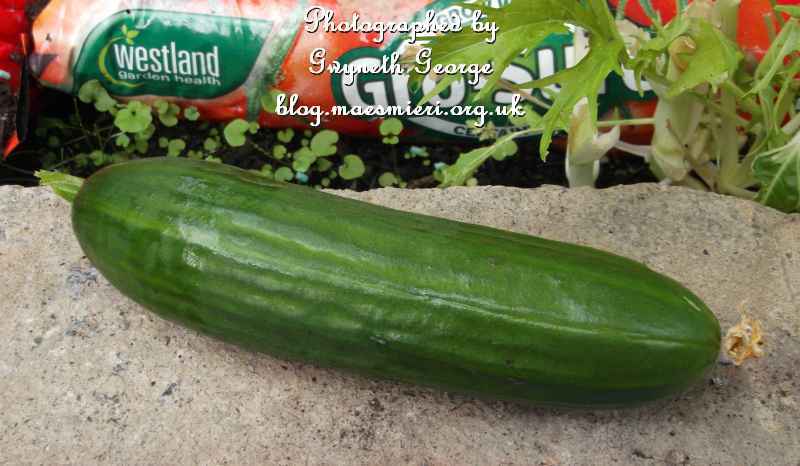 The first cucumber picked this year. Strictly speaking this isn’t cake decorating as the cake isn’t actually decorated. This platter of edible goodies was made for a family member’s birthday last month. 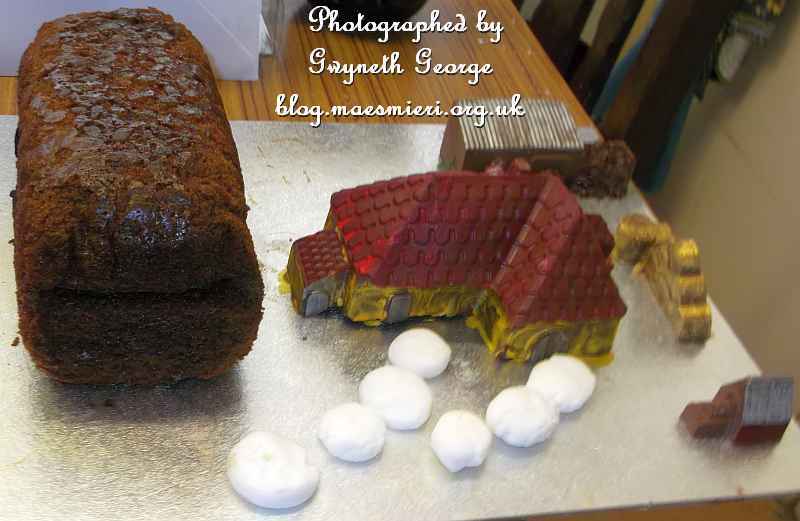 The “barn” is two ginger cake loafs put on top of each other so the top one is upside-down. This was cooked by one of my young nephews, although I did the putting in and taking out of the oven. I was most impressed with how quickly he turned the flour and butter into breadcrumbs perfectly and he did all the weighing out and mixing. 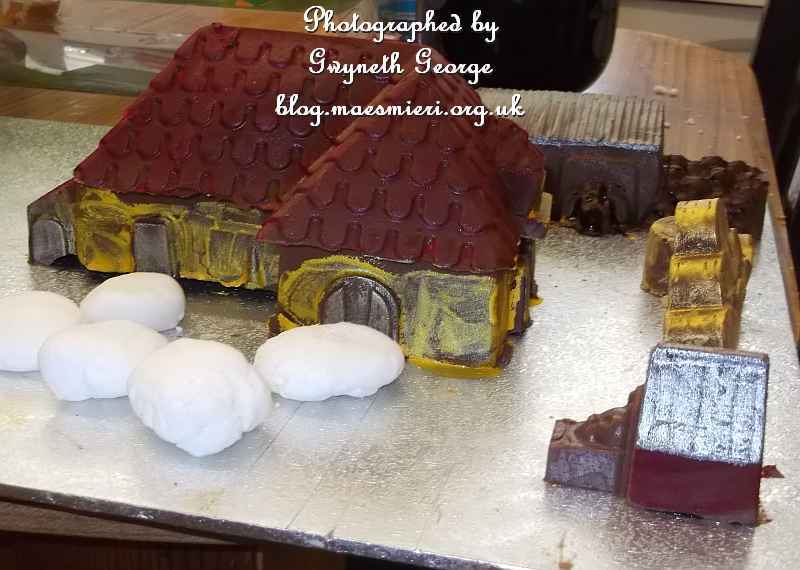 The “farmhouse and outbuildings” I did – a silicone mould and a big bag of Belgian chocolate that I melted and poured in. After all the pieces had set hard and I’d popped them out I took my edible shimmers and some brandy and painted the colours on. The “stepping stones” are the contribution of another of my young nephews. They are icing coin sweets. He loves these sweets so much I just couldn’t get him to make them any smaller to be more in size with the “farmhouse” – as far as he’s concerned they only need to be small enough to fit in his mouth. A closer look at a part of our edible creation. I’ve done too much! I admit it. 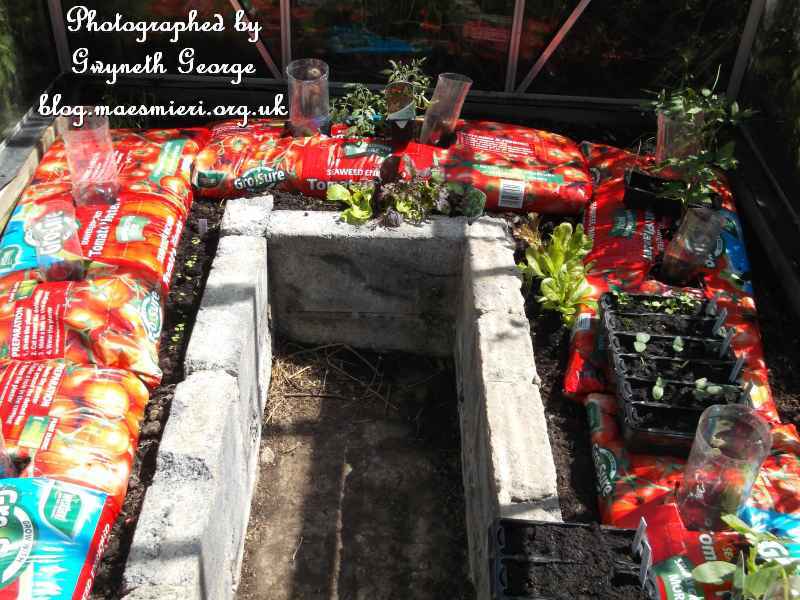 With my health/disability issues it was highly stupid of me to spend over an hour out in the garden Thursday afternoon. I usually do a stint of around 20 minutes in the morning and 20 minutes in the evening out in the garden, sitting down and puttering in the greenhouse or sat at my raised bed, strawberry tower or potato sacks – but I decided to sit outside and try and clear some of the brambles from around the greenhouse, cutting and moving some and then moving my chair forward. As rain was on the way I decided to keep going for a bit as I knew I wouldn’t be able to work out there at my usual time of puttering in the evening. So now I’m in rather a lot of pain with the M.E. symptoms being quite bad. Now I remember why I only putter for 20 minutes before coming back in and resting in bed! So today I’ve only been out to do the necesary of feeding and letting our dog out to her large enclosure in the garden as well as watering the greenhouse, and again in the evening to water again and give our dog her treats and tickles before she was put to bed for the night. No gardening, and very little else. 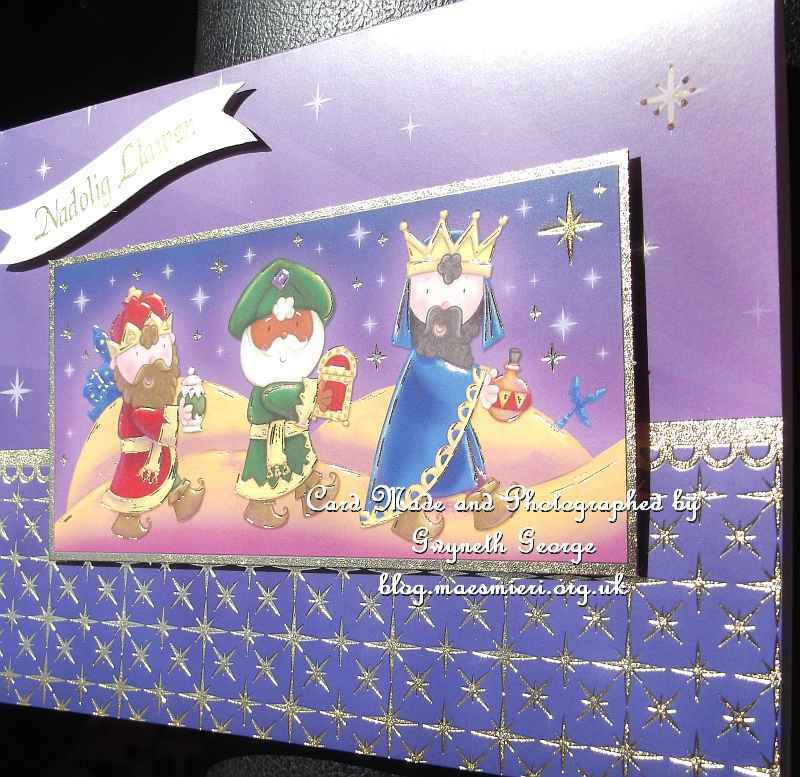 What I did do was make a small number of Christmas cards from toppers I got in a Hunkydory kit, and also put together some digital card fronts and scrapbook layouts. All sat in bed trying to move slowly and not jar screaming muscles. Hopefully we’ll have some better weather and some sunlight tomorrow so that I can photograph what I’ve made today. In the meantime I’ve got a few items I put together earlier in the week to show you. I hope you like them. 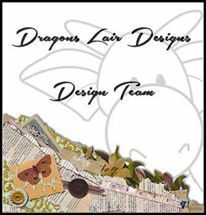 I just thought I’d give you a quick reminder that there’s a Design Team Call currently going on for the “Stampin with the Dragon” challenge blog. All sorts and levels of crafters are being invited to apply. The call runs until the 30th June and you can get the details by clicking -> Here! 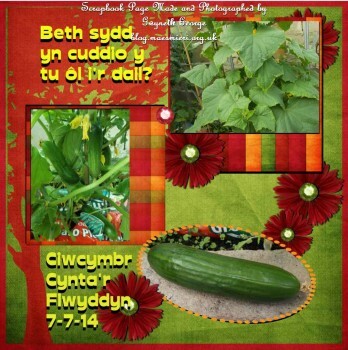 You still have some time to get your entry in for the current challenge, which is on the theme “Clean & Simple”. 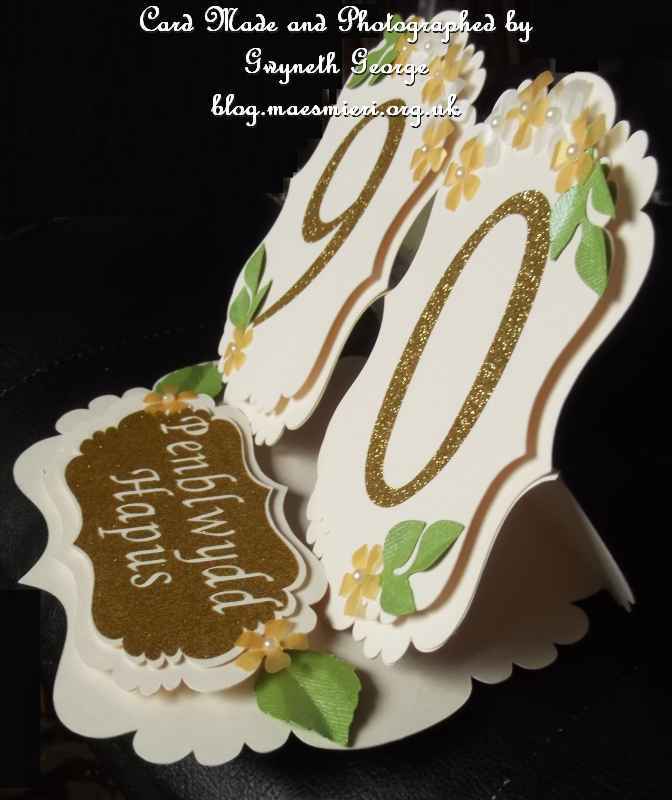 There are a few inspiration examples up on the blog for you to look at, but you can make one entry using anything you wish. 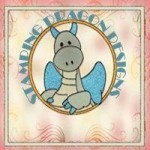 It’s only if you want to have a second entry that you need to make sure that one of them has something Stamping Dragon Designs used in the creation. Details of the challenge can be found -> Here! 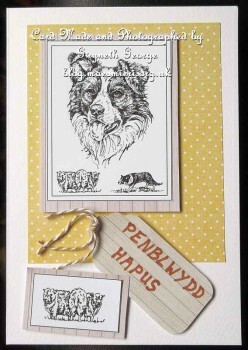 Angled view of the decoupage on the card. Angled view of the card front. Closer look at the flower and the cut decoration. 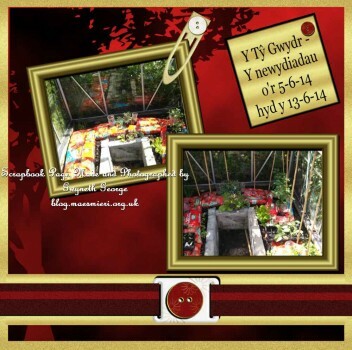 Photo of the greenhouse taken the same time as the first on the scrapbook layout. 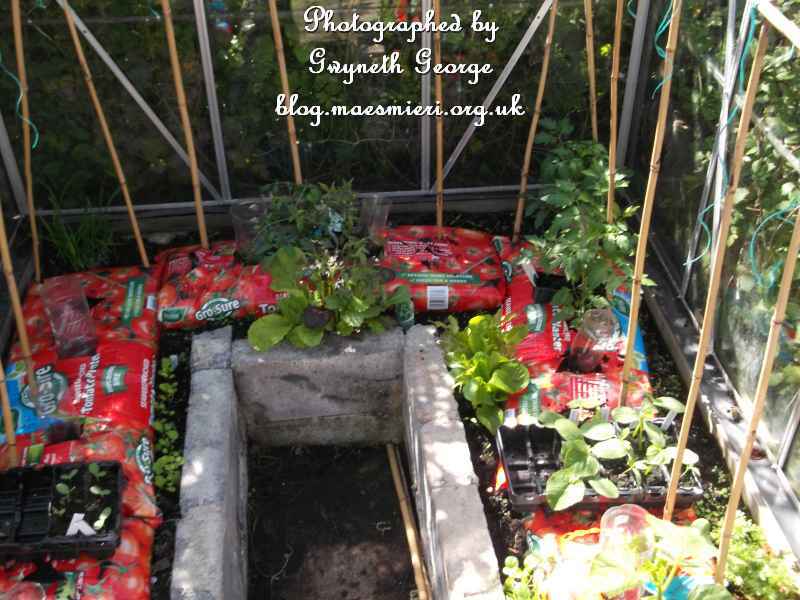 Photo of the greenhouse on the second date. This one was made for one of my brothers-in-law – this one doesn’t work on a farm (he’s a London cabbie) so the youngest nephews decided that his bracelet didn’t need smelly bands in his bracelet. 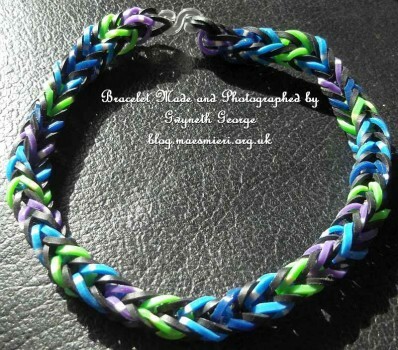 This bracelet is made with black elastic loom bands interspaced with an assortment of random coloured bands that have white spots on. 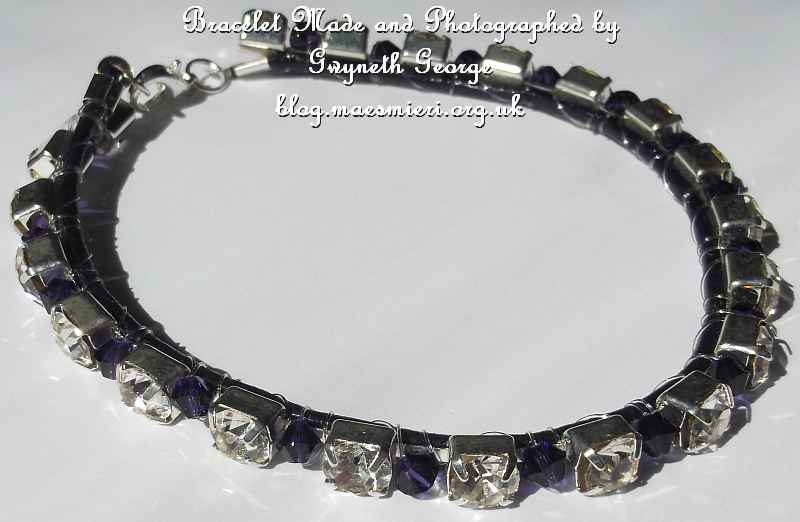 A different angled view of the whole bracelet. 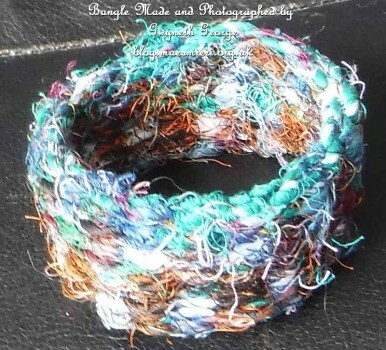 A closer look at the fishtail detail of the bracelet. This one is for my youngest sister, again not one of the family members who does a “dirty and smelly” job – she’s a teacher – so no need for nice smelling elastic bands. 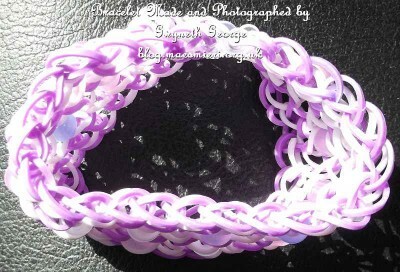 This sister likes purple so her bracelet had to be made of purple bands and beads. This bracelet is a double string of fishtail pattern elastic loom bracelets, joined at both ends into single strands and continuged in the fishtail pattern until the bracelet was large enough and finished off with an S clip. The double braid section was joined using jump rings with a small purple wooden bead on each. 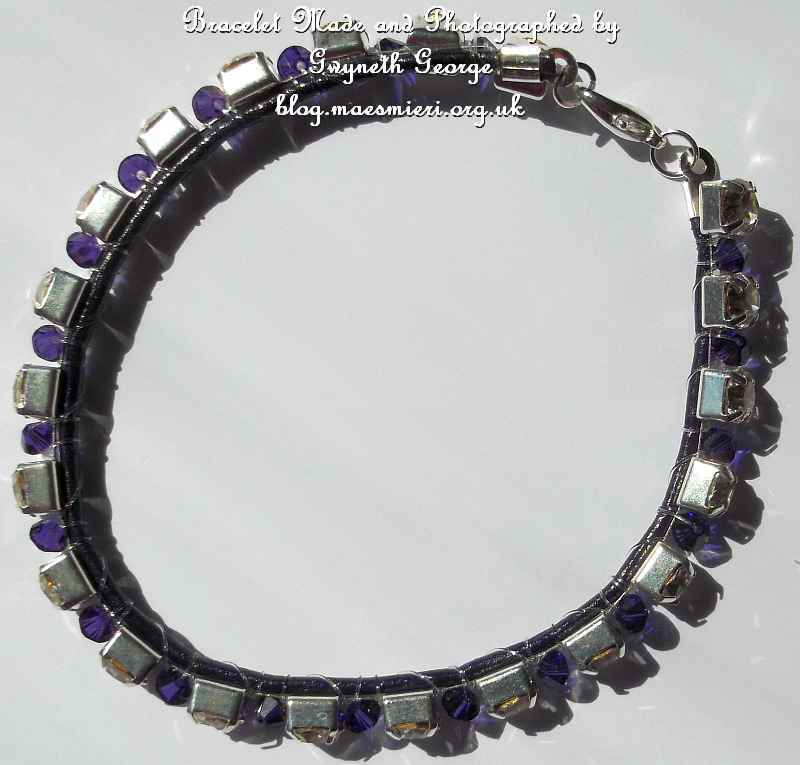 Different angled view of the bracelet. 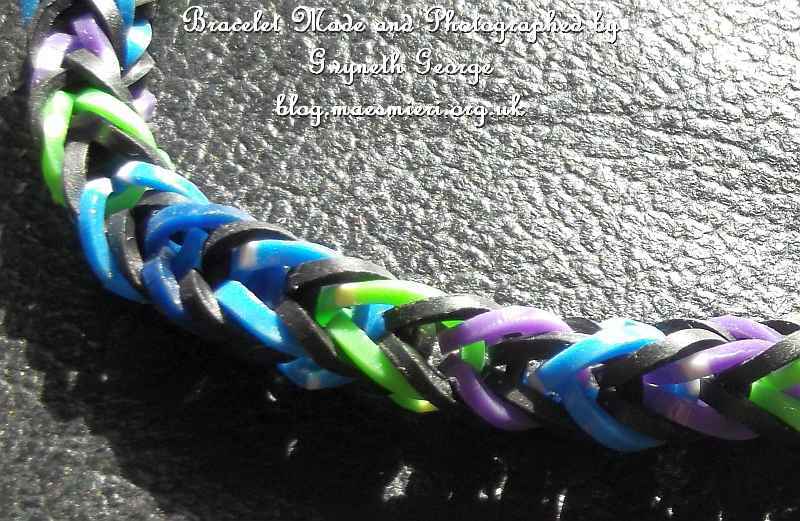 View of the beads attached to both fishtail braided bracelets with jump rings.